Ahmad bin Yahya Hamidaddin (June 18, 1891 – September 19, 1962) was the penultimate king of the Mutawakkilite Kingdom of Yemen, who reigned from 1948 to 1962. His full name and title was H.M. al-Nasir-li-Dinullah Ahmad bin al-Mutawakkil 'Alallah Yahya, Imam and Commander of the Faithful, and King of the Mutawakkilite Kingdom of the Yemen. Ahmad's ruthless, arbitrary and inconsistent rule made him the subject of a coup attempt, frequent assassination attempts and eventually lead to the downfall of the kingdom shortly after his death. His enemies ranged from ambitious family members to forward-looking pan-Arabists and Republicans and from them he was given the name "Ahmad the devil." He remained surprisingly popular among his subjects, particularly the northern tribesmen from whom he had the name "Big Turban". For his remarkable ability to narrowly escape numerous assassination attempts, he was known as al-Djinn. Like his father, Ahmad was profoundly conservative, but nevertheless forged alliances with the Soviet Union, Communist China and the Republic of Egypt, all of which provided economic and military aid to the kingdom. These alliances were largely driven by his desire to expel the British from southern Yemen and recover the Aden Protectorate as part of Greater Yemen. In the end he turned against Egypt, which after his death supported a republican coup against his son and successor. On September 19, 1962 Ahmad died in his sleep. Currency: Riyal = 40 Buqsha = 80 Halala. Y#11.1 1/80 Riyal (Half Buqsha). Year: AH1368-1382. Weight 3.30 grams. Metal: Bronze (Red to Yellow). Diameter: 21.50 mm. Edge: Plain. Alignment: Medal. Mint: Sana'a, Yemen. 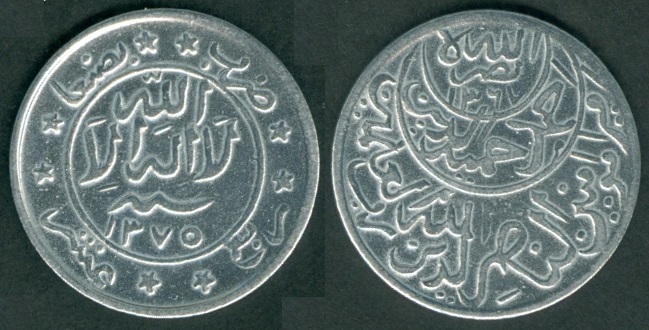 Obverse: "لا اله الا الله" (There is no God except Allah) written in center circle. 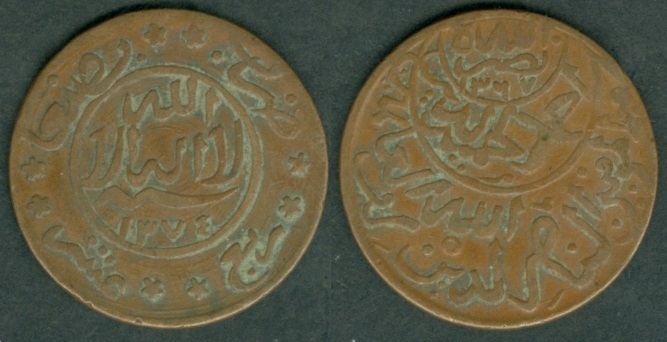 "ضرب بصنعاء" (Struck at Sana'a) written at the top with two stars between these two words. Total 8 stars outside center circle. Value "ثمن عشر" (eighth of one tenth = 1/80) written at the bottom with one or two Star between these two words. 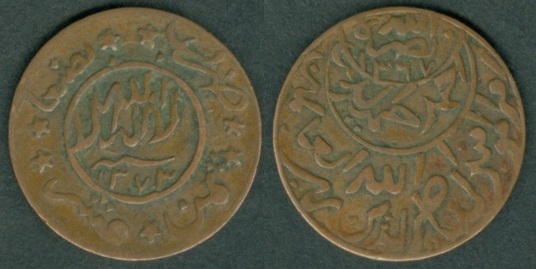 "سنة" (Year) written above Date. 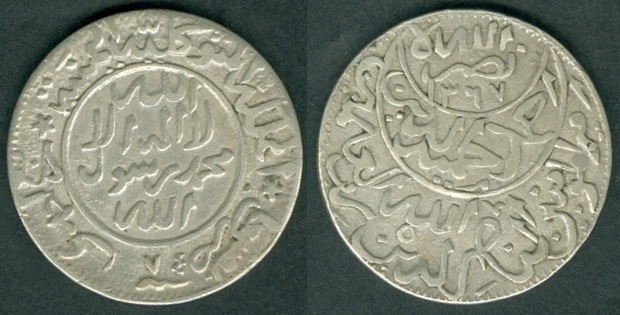 Reverse: "نصره الله" (May Allah assist him) written at the top crescent with Accession Date AH 1367. 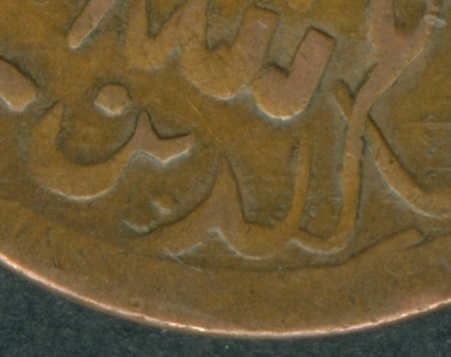 "أحمد حميد الدين" (Ahmad Hamidaddin) written in the center crescent. "أمير المؤمنين، الناصر لدين الله رب العلمين" [Amir al-Mumenin al-Nasir Ad-Din Allah Rab 'Alamin (Commander of the Faithful, The Victor for the Religion of Allah, the lord of the worlds)] written in the large bottom crescent. Mintage: N/A. Mintage Years: AH1368, AH1371, AH1372, AH1373, AH1374, AH1275 Error for 1375, AH1375, AH1376, AH1376/86 Error, AH1278 Error for 1378, AH1378, AHx379, AH1379, AH1380/1, AH1380/79, AH1380/9, AH1380, AH1381/80/79, AH1381/79, AH1381 and AH1382 (1949-1962). 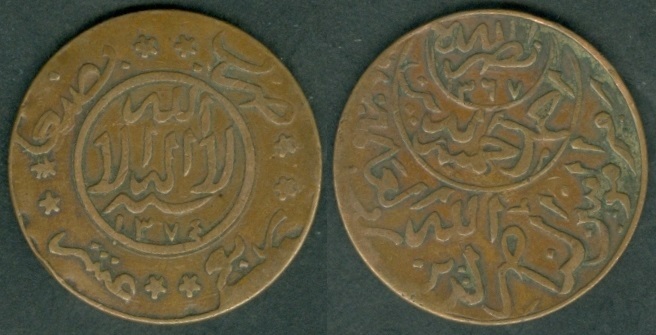 Note: Varieties of arrangement of legends, form of crescent, and size of circle on reverse exist. Some earlier dates exist on thinner planchets. Y#11.2 dated AH1371 exist without "sannah" (wave symbol) above Date. AH1371-1374 and some AH1381 (not overdate) - 7 stars. AH1375-1381 including some AH1381, some AH1382, and all AH1381 overdates - 8 stars. Year: AH 1368 (1949). Weight: 3.89 g. Alignment: Rotated. Mintage: N.A. Note: Large "بصنعاء" (at Sana'a) at top left side. 8 stars in outer circle. Type1: Large "Sannah" (wave symbol) above Date. Year: AH 1371 (1951). Weight: 1.99 g. Alignment: Medal. Mintage: N.A. Note: Large "بصنعاء" (at Sana'a) at top left side. 7 stars in outer circle. Type2: Medium "Sannah" (wave symbol) above Date. Size and position varies of the legends from above coin within the center circle. Year: AH 1371 (1951). Weight: 2.03 g. Alignment: Medal. Mintage: N.A. 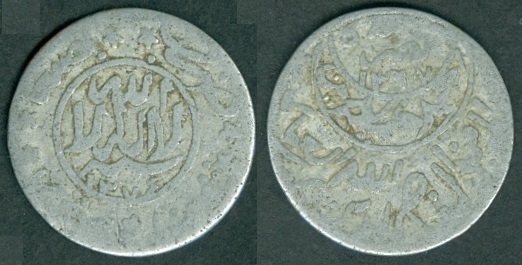 Type3: The Accession Date side differs from the above coin. Gaps are seen at the bottom line. Year: AH 1371 (1951). Weight: 2.00 g. Alignment: Medal. Mintage: N.A. Year: AH 1372 (1952). Weight: 3.44 g. Alignment: Rotated. Mintage: N.A. Year: AH 1372 (1952). Weight: 2.12 g. Alignment: Medal. Mintage: N.A. Year: AH 1373 (1953). Weight: 3.48 g. Alignment: Medal. Mintage: N.A. Year: AH 1373 (1953). Weight: 3.44 g. Alignment: Medal. Mintage: N.A. 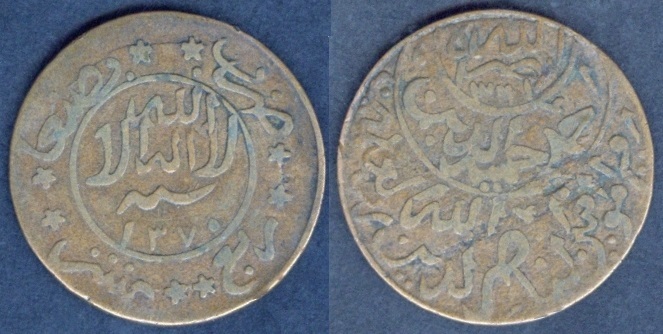 Type3: Same as above coin, but Accession Date within the top circle. Year: AH 1373 (1953). Weight: 3.36 g. Alignment: Medal. Mintage: N.A. Type4: "Sannah" (wave symbol) covering above all digits in Date. 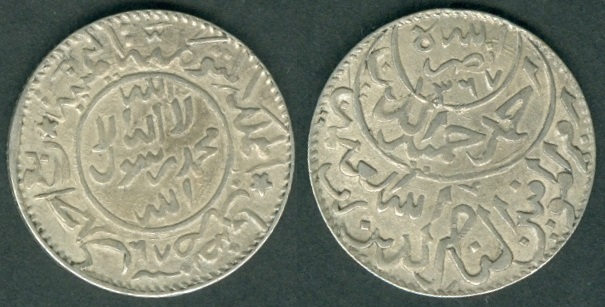 Different "Ad-Din" dots style. 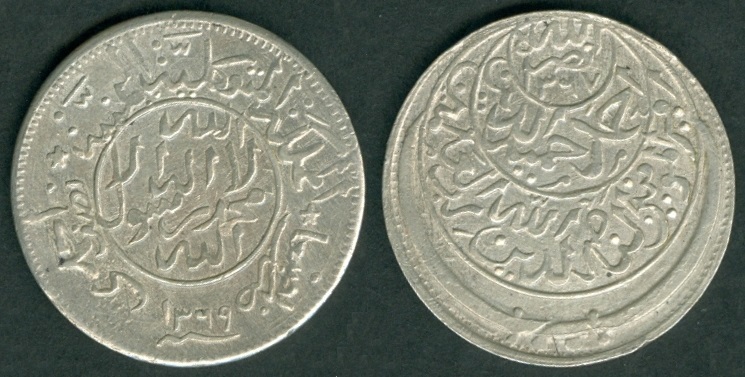 Small "بصنعاء" type. Year: AH 1373 (1953). Weight: 3.45 g. Alignment: Medal. Mintage: N.A. Note: Small "بصنعاء" (at Sana'a) at top left side. 7 stars in outer circle. Type1: Thick "Sannah" (wave symbol) above Date. Thick size legends within the center circle. Year: AH 1374 (1954). Weight: 3.33 g. Alignment: Medal. Mintage: N.A. Type2: Medium "Sannah" (wave symbol) above Date. Medium size legends within the center circle. Year: AH 1374 (1954). Weight: 3.44 g. Alignment: Medal. Mintage: N.A. 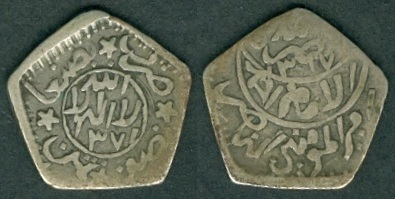 Type3: Very Small "Sannah" (wave symbol) above Date. Year: AH 1374 (1954). Weight: 3.42 g. Alignment: Medal. Mintage: N.A. Type1: The digit "3" in Accession Year is converted from digit "2". 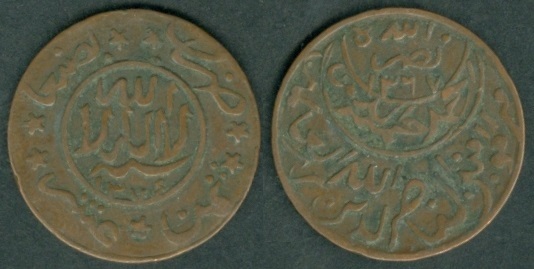 Year: AH 1275 error for 1375 (1955). Weight: 3.21 g. Alignment: Medal. Mintage: N.A. Note: Small "بصنعاء" (at Sana'a) at top left side. 8 stars in outer circle. 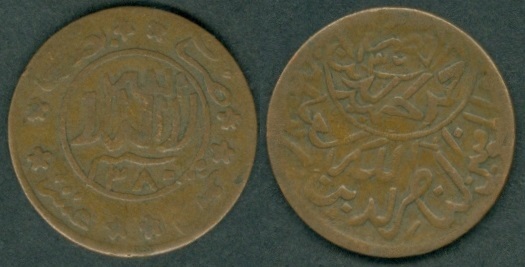 Type2a: Large digit "3" in Accession Year. Gaps in the bottom line of the Accession Date side. Digit "3" in Date is converted from digit "2". Year: AH 1375 (1955). Weight: 3.04 g. Alignment: Medal. Mintage: N.A. 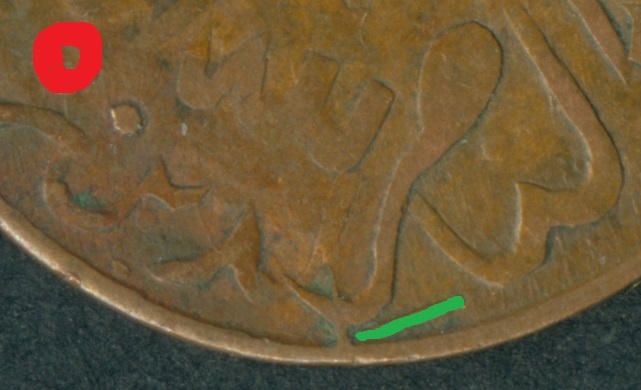 Type2b: Same as above coin but in Coin alignment as shown. Type1: Thick "Sannah" (wave symbol) above Date. The digit "3" in Accession Year is converted from digit "2". Year: AH 1378 (1958). Weight: 3.27 g. Alignment: Medal. Mintage: N.A. Type2: Medium "Sannah" (wave symbol) above Date. Wave symbol covering last three digits of the Date. The digit "3" in Accession Year is converted from digit "2". Year: AH 1278 error for 1378 (1958). Weight: 3.29 g. Alignment: Medal. Mintage: N.A. Type3: Thin "Sannah" (wave symbol) above Date. Wave symbol covering last three digits of the Date. The digit "3" in Accession Year is converted from digit "2". Year: AH 1278 error for 1378 (1958). Weight: 3.28 g. Alignment: Medal. Mintage: N.A. 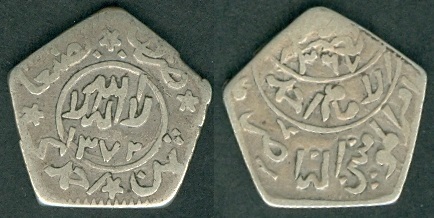 Type4: Medium "Sannah" (wave symbol) above Date as Type 2. 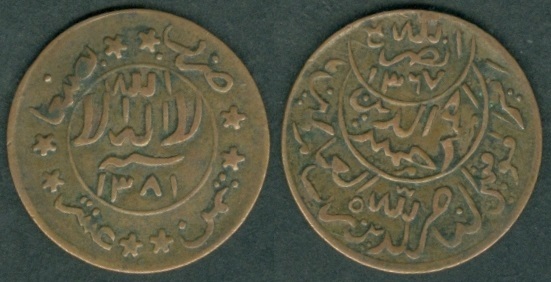 "Ad-Din" style has above circle, which makes it different. The digit "3" in Accession Year is converted from digit "2". Year: AH 1278 error for 1378 (1958). Weight: 3.26 g. Alignment: Rotated. Mintage: N.A. Type1a: Digit "1" missing in Date. The digit "3" in Date and Accession date is changed from digit "2". Accession Date side seems to be struck twice create double images. Year: AH 1379 (1959). Weight: 3.50 g. Diameter: 21.25 mm. Alignment: Medal. Mintage: N.A. 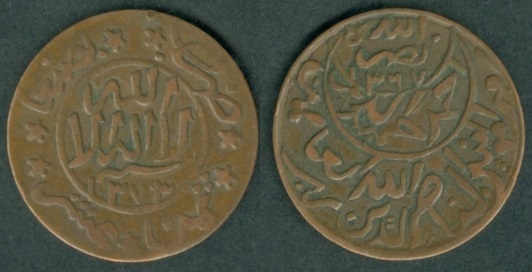 Type1b: Same as above coin, but in Coin alignment as shown. Type2: Same as Type1a but, thick legend on Date side within the center circle. 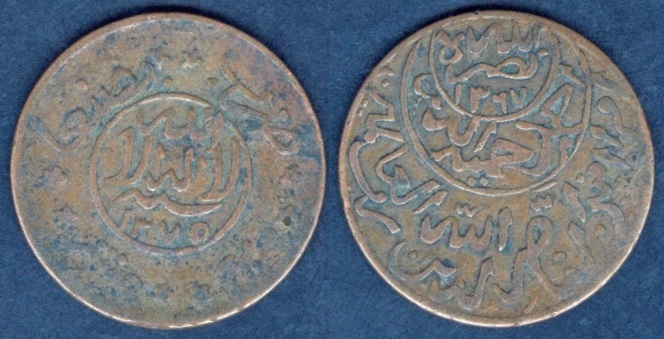 Accession Date side has different size and position of legends from above coins. Not twice struck. Year: AH 1379 (1959). Weight: 3.45 g. Diameter: 21.25 mm. Alignment: Medal. Mintage: N.A. Type3a: Digit "1" is visible in Date. The Accession Date is over written. Year: AH 1379 (1959). Weight: 3.48 g. Diameter: 21.25 mm. Alignment: Medal. Mintage: N.A. 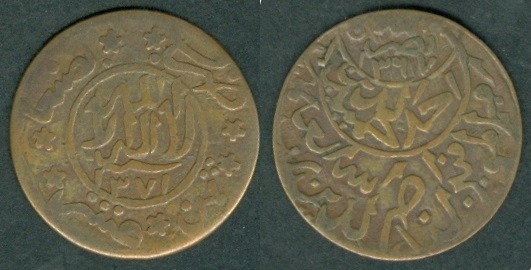 Type3b: Same as above coin, but in Coin alignment as shown. Year: AH 1380 (1960). Weight: 3.39 g. Alignment: Coin. Mintage: N.A. Note: Large "بصنعاء" (at Sana'a) at top left side. 8 stars in outer circle. Square dot in Date. The digit "3" in Accession Year is converted from digit "2". Year: AH 1380/79 (1960). Weight: 3.36 g. Diameter: 22.00 mm. Alignment: Medal. Mintage: N.A. Note: Small "بصنعاء" (at Sana'a) at top left side. 8 stars in outer circle. Square dot in Date. Overlapped date as shown. 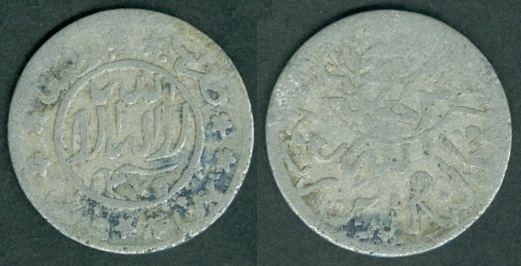 Type1a: Normal issue with nothing below "Al-Nasir". 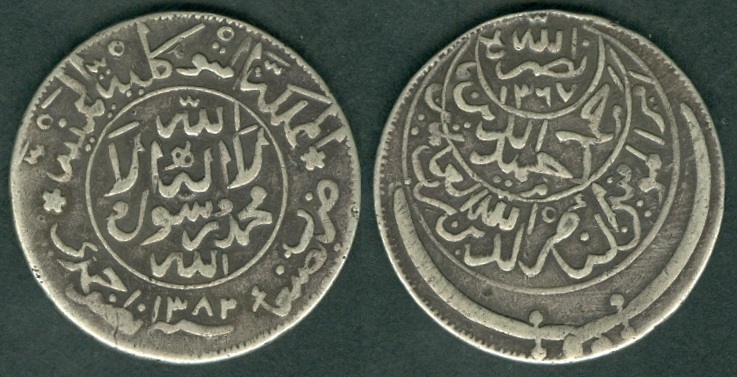 Circle above "Ad-Din" is far left. Year: AH 1381 (1961). Weight: 3.26 g. Diameter: 22.00 mm. Alignment: Medal. Mintage: N.A. Weight: 3.08 g. Alignment: Rotated. Type2: Digit "8" high in Date. The "Sannah" (wave symbol) exactly in the center between above legends and Date below in the center circle. 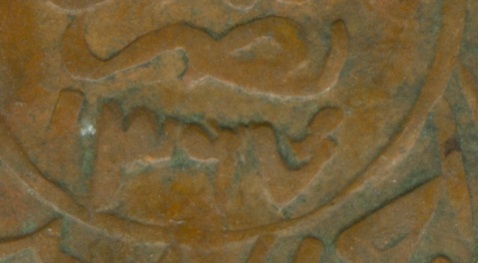 Digit "3" is made "2" in the Accession Date. 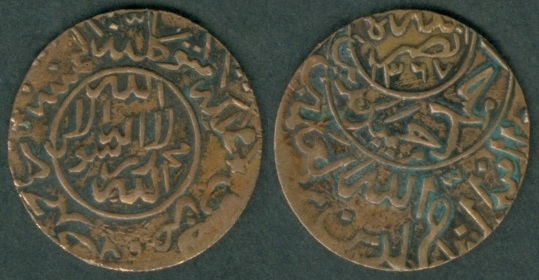 No circle above "Ad-Din". Year: AH 1381 (1961). Weight: 3.35 g. Alignment: Medal. Type3: The "Sannah" (wave symbol) exactly in the center between above legends and Date below in the center circle. 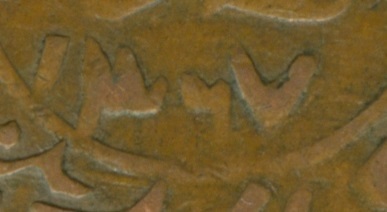 Digit "3" is made "2" in the Accession Date. 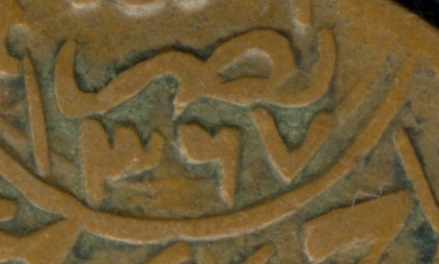 "صر" symbol below "Al-Nasir" and the circle above "Ad-Din" is far left. Year: AH 1381 (1961). Weight: 3.26 g. Alignment: Medal. 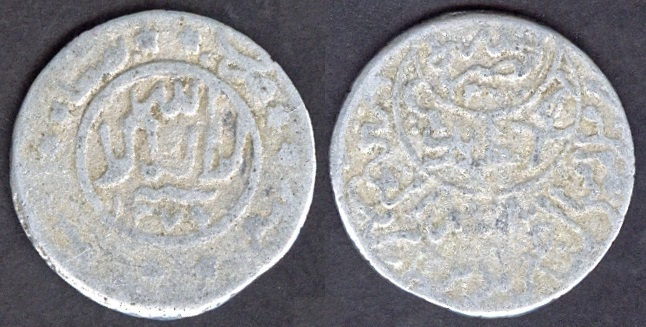 Type4: Same as above coin having "صر" symbol below "Al-Nasir" and circle is above "Ad-Din". Year: AH 1381 (1961). Weight: 3.21 g. Alignment: Rotated. Type5: Large legends within the center circle. 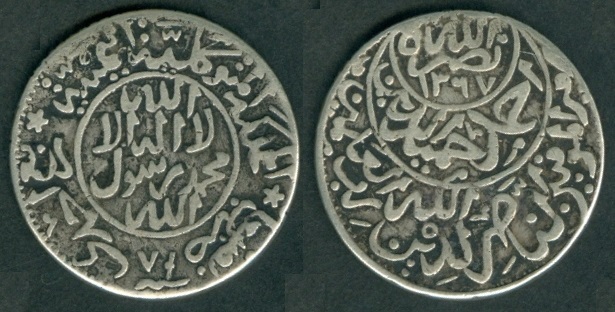 Circle is above "Ad-Din". Year: AH 1381 (1961). Weight: 3.18 g. Alignment: Medal. Year: AH1381/80/79 (1961). Weight: 3.41 g. Alignment: Medal. Type1: Thick Date. Circle far left above "Ad-Din". Stoke below "Al-Nasir". Year: AH 1382 (1962). Weight: 3.16 g. Alignment: Rotated. Type2: Normal Date. Circle just left above "Ad-Din". 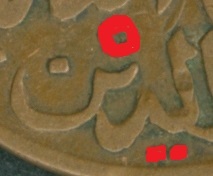 Circle below "Al-Nasir". Overlapping Accession Date. Year: AH 1382 (1962). Weight: 3.27 g. Alignment: Medal. Year: AH 1386/76 or AH1376/86 Error (1962). Weight: 2.97 g. Alignment: Rotated. 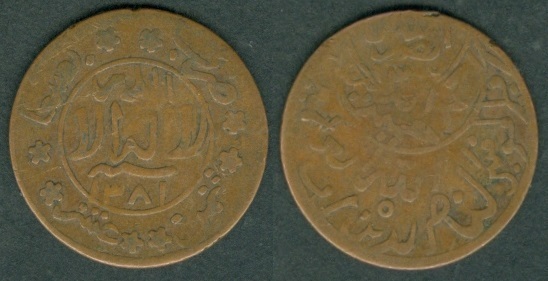 Y#11a 1/80 Riyal (Half Buqsha). Year: AH1374-1380. Weight 1.00 grams. Metal: Aluminum. Diameter: 21.00 mm. Edge: Plain. Alignment: Medal. Mint: Sana'a, Yemen. 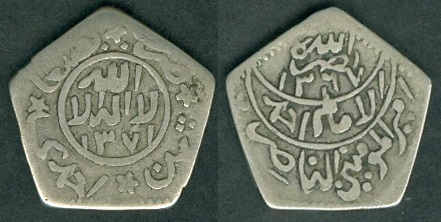 Obverse: "لا اله الا الله" (There is no God except Allah) written in center circle. 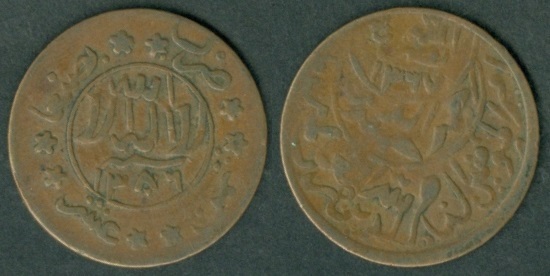 "ضرب بصنعاء" (Struck at Sana'a) written at the top with two stars between thesetwo words. Total 8 stars outside center circle. Value "ثمن عشر" (eighth of one tenth = 1/80) written at the bottom with one or two Star between these two words. 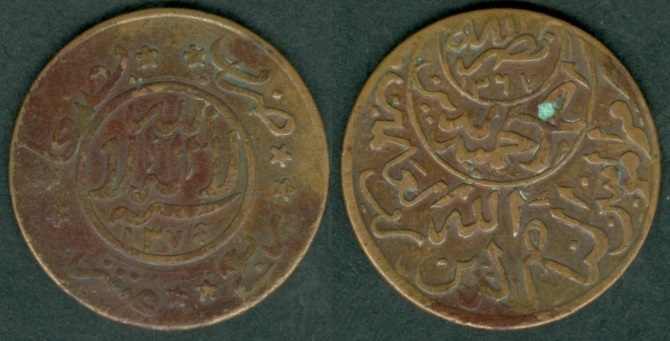 "سنة" (Year) written above Date. 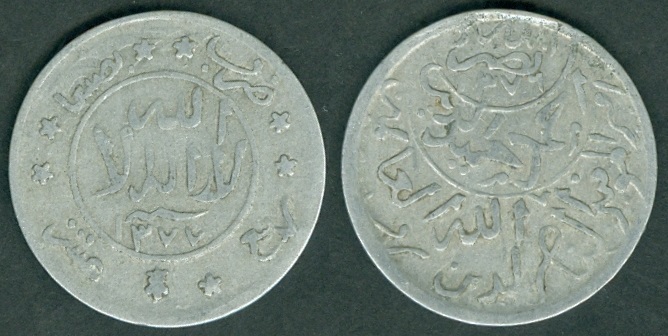 Reverse: "نصره الله" (May Allah assist him) written at the top crescent with Accession Date AH 1367. 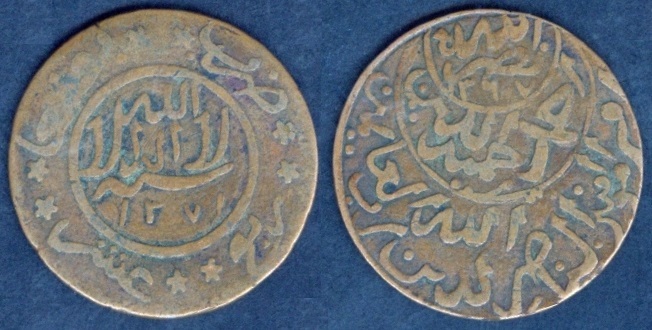 "أحمد حميد الدين" (Ahmad Hamidaddin) written in the center crescent. "أمير المؤمنين، الناصر لدين الله رب العلمين" [Amir al-Mumenin al-Nasir Ad-Din Allah Rab 'Alamin (Commander of the Faithful, The Victor for the Religion of Allah, the lord of the worlds)] written in the large bottom crescent. Mintage: N/A. Mintage Years: AH1374, AH1375, AH1376, AH1377, AH1378, AH1378/6, AH1379, AH1379/5, AH1379/8 and AH1380 (1954-1960). Note: AH1374 and some AH1380 have 7 stars, the rest have 8 stars on reverse. 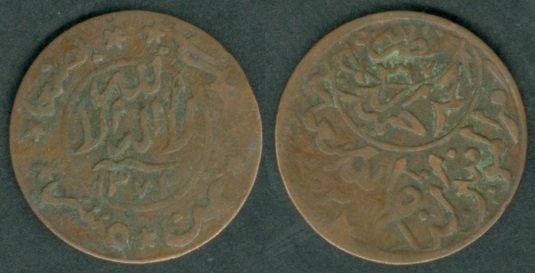 Dies of 1/80 Riyal, Y#11.1, were used. Year: AH 1374 (1954). Weight: 0.80 g. Diameter: 20.50 mm. Alignment: Rotated. Mintage: N.A. Note: 7 stars instead of 8 stars in outer circle. Year: AH 1375 (1955). Weight: 0.86 g. Diameter: 20.50 mm. Alignment: Medal. Mintage: N.A. Year: AH 1376 (1956). Weight: 0.87 g. Diameter: 20.50 mm. Alignment: Medal. Mintage: N.A. Type2: Small "Sannah" (wave symbol) above date. Year: AH 1376 (1956). Weight: 0.83 g. Diameter: 20.50 mm. Alignment: Medal. Mintage: N.A. Year: AH 1377 (1957). Weight: 0.88 g. Diameter: 21.00 mm. Alignment: Medal. Mintage: N.A. Type1: Thick "Sannah" (wave symbol) starting point before digit "1" in Date. Year: AH 1378 (1958). Weight: 0.86 g. Diameter: 20.50 mm. Alignment: Medal. Mintage: N.A. Type2: Medium "Sannah" (wave symbol) starting point exactly above and touching digit "1" in Date. Note: Part of ex-jewelry therefore having hole. Type3: Thin "Sannah" (wave symbol) starting point after digit "1" in Date. Note: Extra metal at bottom left side of the Date side. Year: AH 1379/5 (1959). Weight: 0.88 g. Diameter: 20.50 mm. Alignment: Medal. Mintage: N.A. Note: Overlapped date type. Part of ex-jewelry therefore having square hole. Y#11.3 1/80 Riyal (Half Buqsha). Year: AH13(80). Weight 3.30 grams. Metal: Bronze. Diameter: 21.50 mm. Edge: Plain. Alignment: Medal. Mint: Sana'a, Yemen. 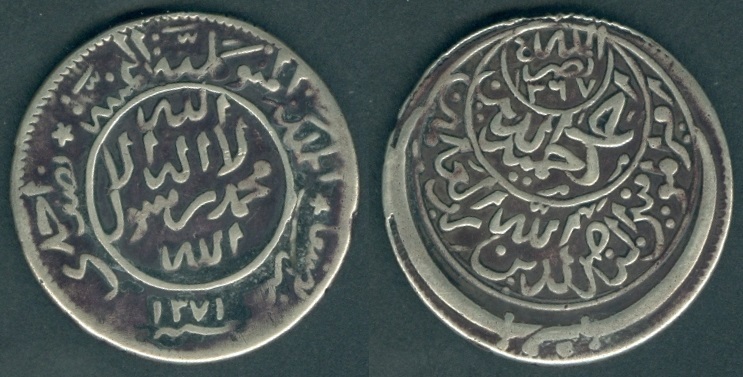 Obverse: "المملكة المتوكلية اليمنية" (Mutawakkilite Kingdom of Yemen) written at the top. "لا اله الا الله" (There is no God except Allah) written in center circle. 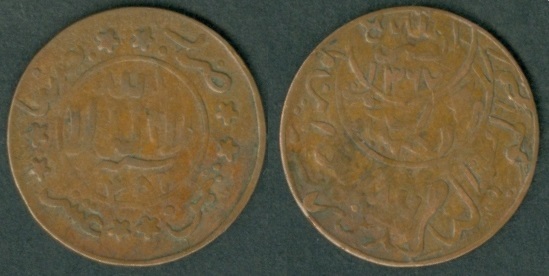 "ضرب بصنعاء" (Struck at Sana'a) written at the bottom right side. 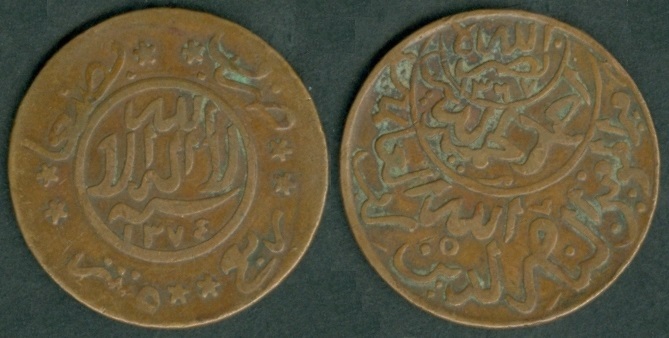 Value "ربع احمدى" (Quarter Ahmadi) written at the bottom left side. One star on each side (total two stars in outer circle). 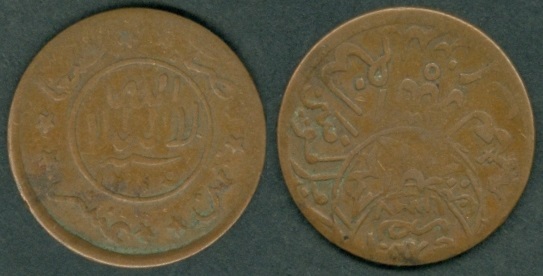 "سنة" (Year) written below the two digit Date at the bottom. 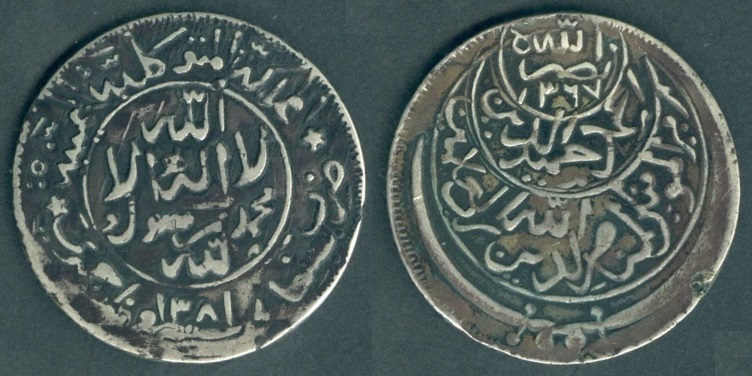 Reverse: "نصره الله" (May Allah assist him) written at the top crescent with Accession Date AH 1367. 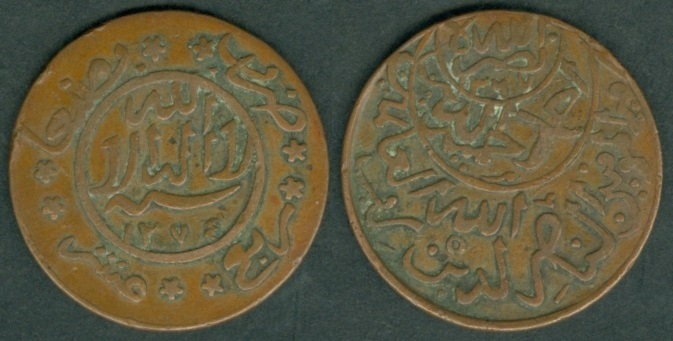 "أحمد حميد الدين" (Ahmad Hamidaddin) written in the center crescent. "أمير المؤمنين، الناصر لدين الله رب العلمين" [Amir al-Mumenin al-Nasir Ad-Din Allah Rab 'Alamin (Commander of the Faithful, The Victor for the Religion of Allah, the lord of the worlds)] written in the large bottom crescent. Mintage: N/A. Mintage Years: One year type. Year: AH (13)80 . Weight: 3.49 g. Diameter: 21.50 mm. Alignment: Medal. Mintage: N.A. 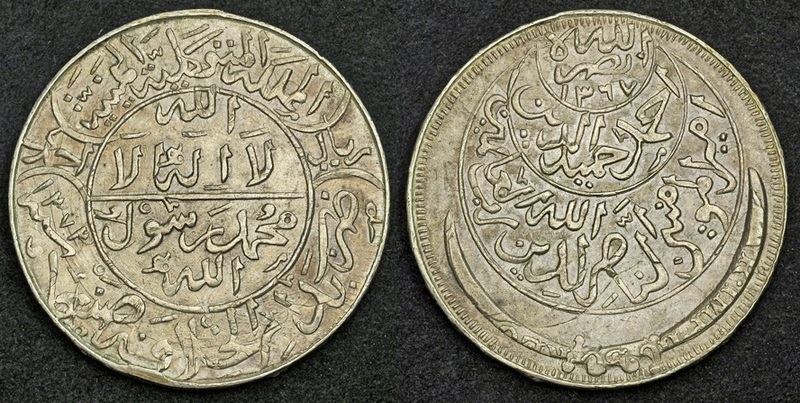 Note: Struck with dies of 1/4 Ahmadi Riyal, Y#15 on 1/80 Riyal planchet. This is consider as rare issue. Y#18 1/80 Riyal (Half Buqsha). Year: ND (1956). Weight 1.00 grams. Metal: Aluminum. Diameter: 22.00 mm. Edge: Plain. Alignment: Medal. Mint: Lebanon. 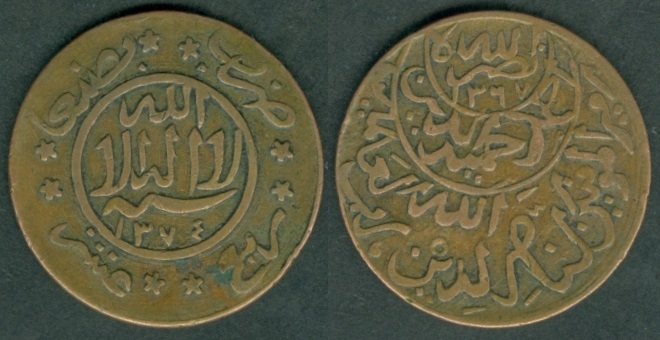 Obverse: "لا اله الا الله" (There is no God except Allah) written at the top. One stars on eac side. 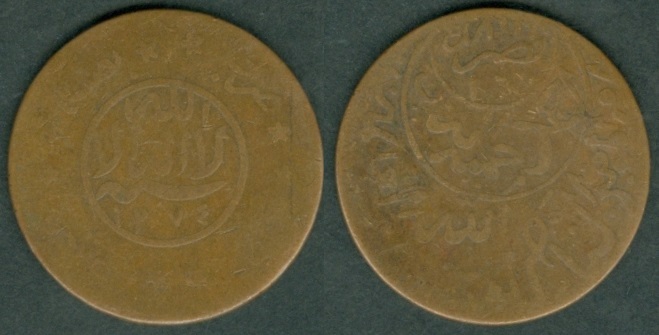 "ضرب بصنعاء" (Struck at Sana'a) written at the bottom right side. Value "ثمن عشر أحمدي" (Ahmadi Eightieth of one tenth = 1/80) written at the bottom left side. Accession Date AH 1367 written at the bottom. Tree in the center with water waves below it, "B" written on the left side and "فر" on the right side, all within the center circle. 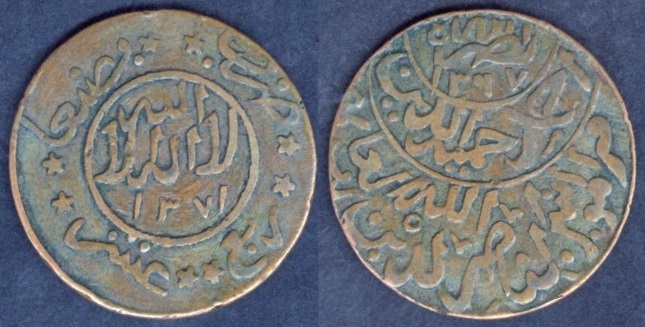 Reverse: Starting from the bottom star clockwise: "أمير المؤمنين، الناصر لدين الله رب العلمين" [Amir al-Mumenin al-Nasir Ad-Din Allah Rab 'Alamin (Commander of the Faithful, The Victor for the Religion of Allah, the lord of the worlds)] written outside around the center circle. 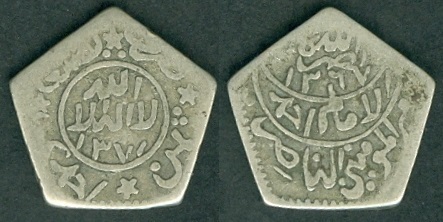 "نصره الله" (May Allah assist him) at the top and "أحمد حميد الدين" (Ahmad Hamidaddin) at the bottom written in the center circle. Mintage: N/A. Mintage Years: One year type. Year: ND. 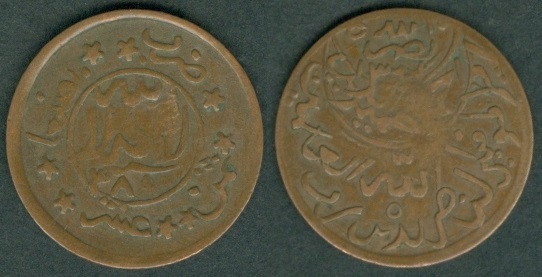 Weight: 0.98 g.
Note: The year AH 1367(1948) on the coin indicated the accession date. 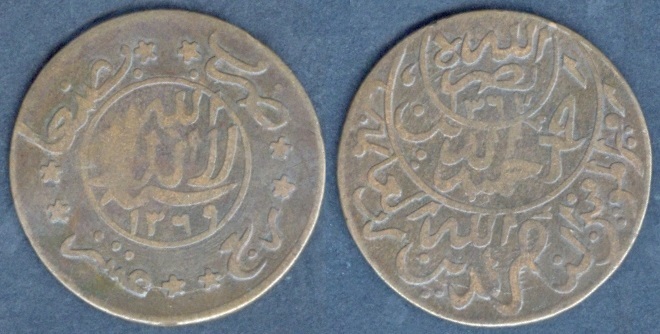 These coins were Struck privately in Lebanon in 1955 and 1956 and released into circulation in 1956. Y#12.1 1/40 Riyal (Buqsha). Year: AH 1368 - 1375. Weight 7.00 grams. Metal: Bronze (Red to Yellow). Diameter: 26.50 mm. Edge: Plain. Alignment: Medal. Mint: Sana'a, Yemen. 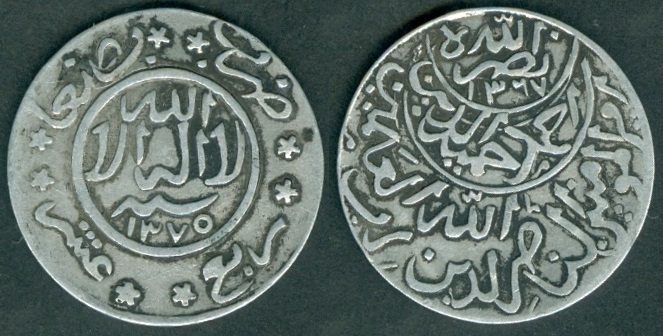 Obverse: "لا اله الا الله" (There is no God except Allah) written in center circle. 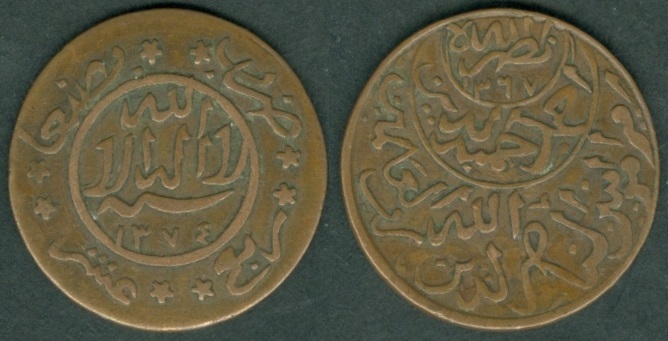 "ضرب بصنعاء" (Struck at Sana'a) written at the top with two stars between these two words. Total 8 stars outside center circle. 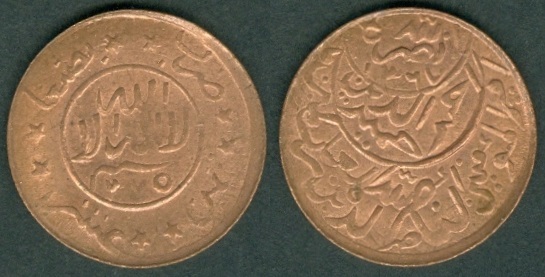 Value "ربع عشر" (Quarter of one tenth = 1/40) written at the bottom with two Star between these two words. 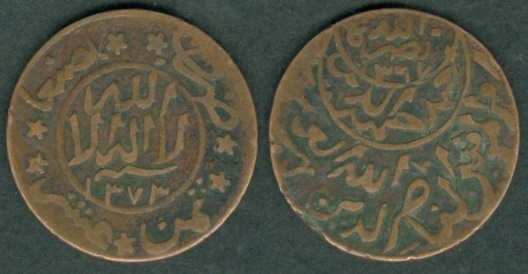 "سنة" (Year) written above Date. 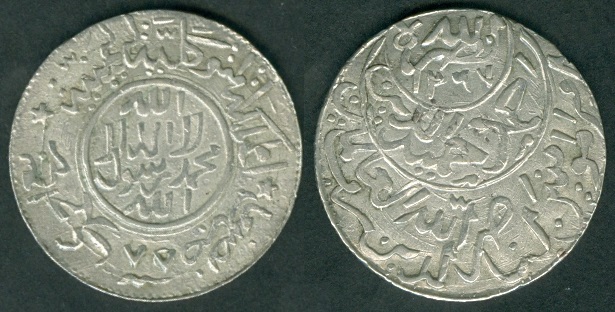 Reverse: "نصره الله" (May Allah assist him) written at the top crescent with Accession Date AH 1367. 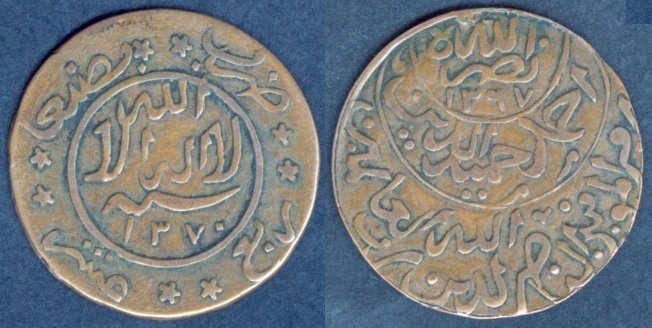 "أحمد حميد الدين" (Ahmad Hamidaddin) written in the center crescent. "أمير المؤمنين، الناصر لدين الله رب العلمين" [Amir al-Mumenin al-Nasir Ad-Din Allah Rab 'Alamin (Commander of the Faithful, The Victor for the Religion of Allah, the lord of the worlds)] written in the large bottom crescent. Mintage: N/A. Mintage Years: AH1368 (AH1368 also exists with accession date 13776 - error type), AH1369, AH1370, AH1371, AH1372, AH1373/1, 1373/2, AH1373, AH1374, AH1375/4 and AH1377 (not confirmed). (1949-1955 and 1957). 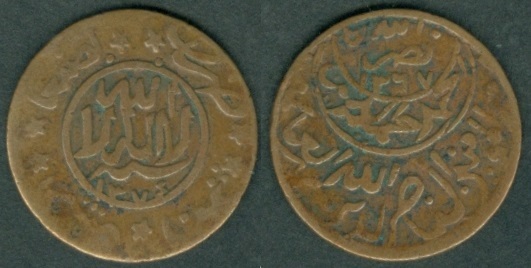 Y#12.1 has large "بصنعاء" (at Sana'a) written on the coins. Year: AH 1368 (1949). Weight: 5.07 g. Diameter: 26.00 mm. Mintage: N.A. Note: Type A of Ad-Din style. Extra metal at 2 o'clock on Accession Date side. Year: AH 1369 (1950). Weight: 6.43 g. Mintage: N.A. Note: Type A of Ad-Din style. Year: AH 1370 (1950). Weight: 3.26 g. Diameter: 26.00 mm. Mintage: N.A. Note: Thin planchet. 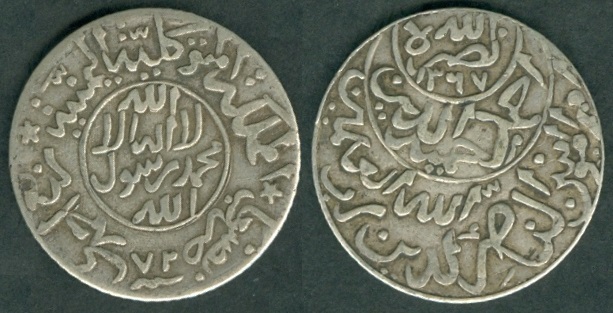 Type A of Ad-Din style but dots tilted right downwards. 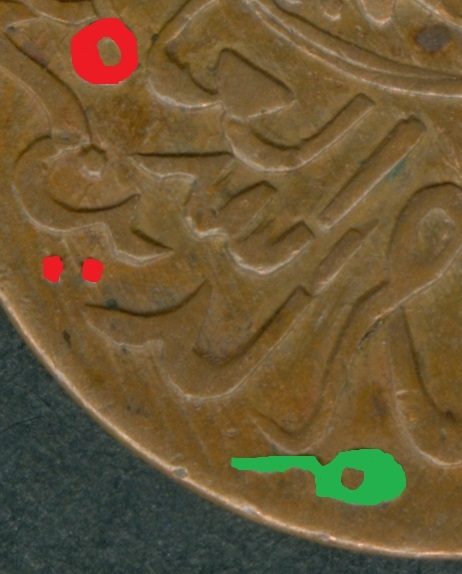 Type2: Thick legends in the center circle with position of various characters varies from above coin. Year: AH 1370 (1950). Weight: 6.19 g. Diameter: 26.25 mm. Mintage: N.A. 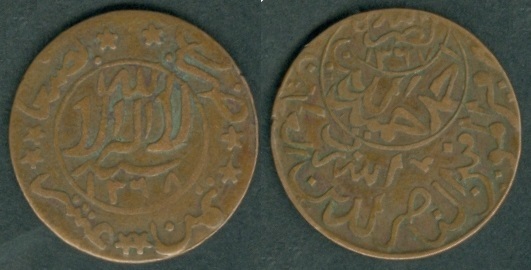 Note: Type A of Ad-Din style but dots tilted right downwards. 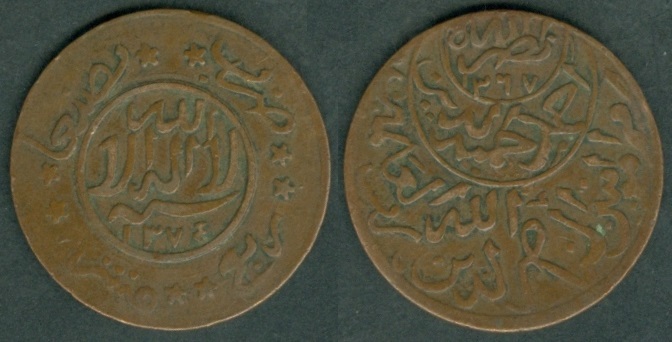 Type3: Almost same position of characters as above coin but thin legends. 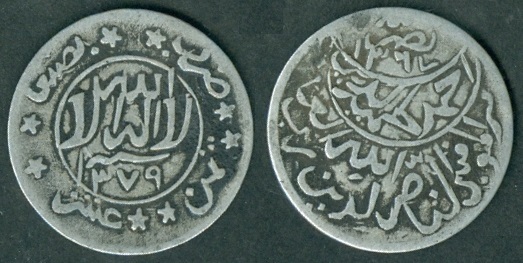 The word "Sannah" (wave symbol) is shorter than above coin. Year: AH 1370 (1950). Weight: 6.66 g. Diameter: 26.25 mm. Mintage: N.A. Year: AH 1371 (1951). Weight: 5.47 g. Diameter: 26.00 mm. Mintage: N.A. 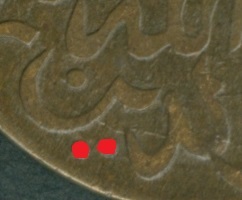 Type2: Water Drop symbol instead of stroke (/) below "Al-Nasir" on Accession Date side, shown in the image. Year: AH 1371 (1951). Weight: 5.40 g. Diameter: 26.00 mm. Mintage: N.A. Year: AH 1372 (1952). Weight: 6.60 g. Diameter: 26.00 mm. Mintage: N.A. Note: Type B of Ad-Din style. Year: AH 1373/1 (1953). Weight: 6.74 g. Mintage: N.A. Note: Overlapped date type, 7 looks like Y. 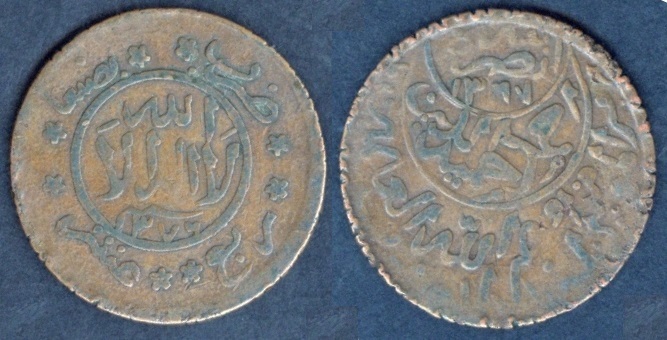 Type B of Ad-Din style. Year: AH 1373 (1953). Weight: 6.69 g. Mintage: N.A. Type2: Digit "1" in Date touching the end of word "Sananh" (wave symbol). Size and position slightly varies of the legends from above coin within the center circle. Two stars at the bottom are very close to each other. Year: AH 1373 (1953). Weight: 6.82 g. Mintage: N.A. Type1: Normal legends within the center circle. 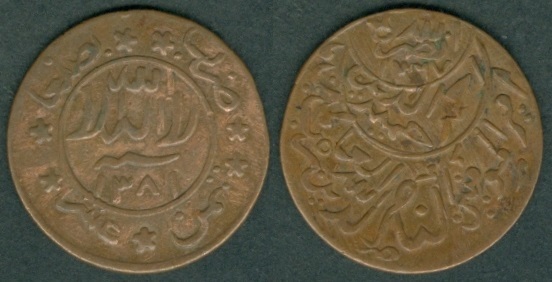 Type B of Ad-Din style. Weight 6.64 grams. 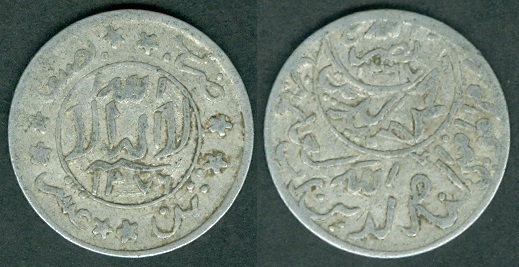 Type2: Same as above coin but extra metal at 5 o' clock below "ربع" at the Date side. 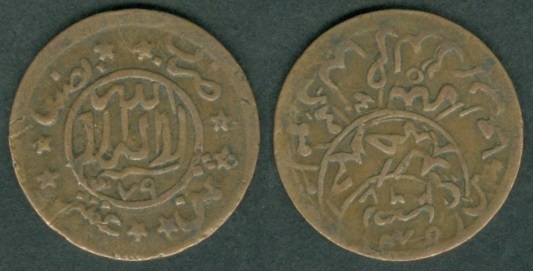 Type B of Ad-Din style. Weight 6.68 grams. 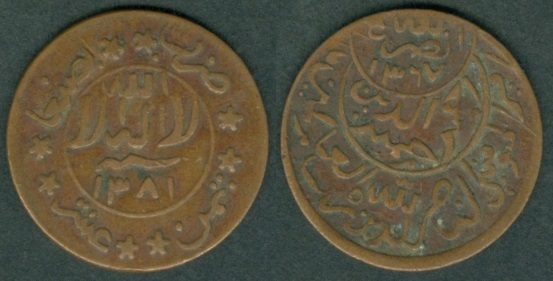 Same as above coin with Type C of Ad-Din style. Weight 6.96 grams. Type3: The legend on the left side within the circle is overlapping on the circle. Type C of Ad-Din style. Weight 6.83 grams. 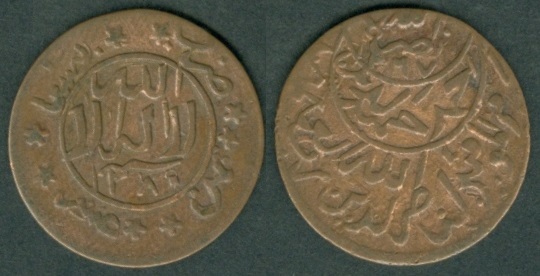 Same as above coin with Type D of Ad-Din style. Weight 6.70 grams. 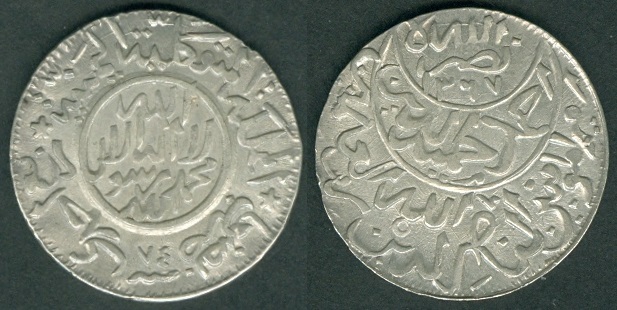 Type4: Tilted "الله" written at the top in the inner circle. Two stars at the bottom are close to each other. Type C of Ad-Din style. Weight 6.77 grams. 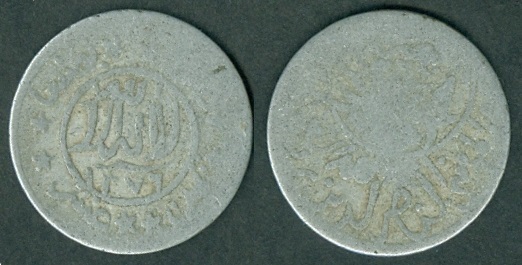 Same as above coin with Type D of Ad-Din style. Weight 6.84 grams. Type5: same as Type4 but having thicker legends within the circle circle. Type C of Ad-Din style. Weight 6.72 grams. Note: This coin is slightly rotated. 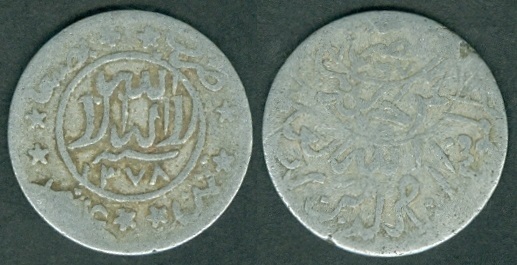 Same as above coin with Type D of Ad-Din style. Weight 6.78 grams. Type6: The word "Sannah" (wave symbol) far from the Date. 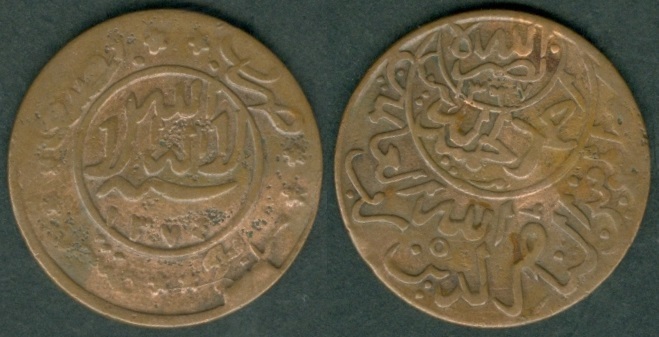 Type B of Ad-Din style. Weight 6.73 grams. Note: This coin is silver washed. 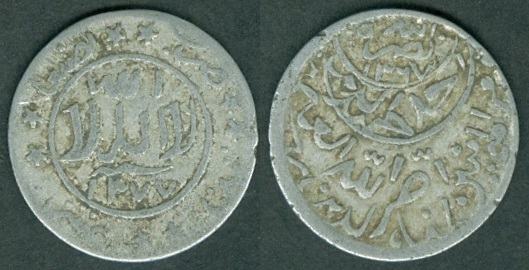 Same as above coin with Type E of Ad-Din style. Weight 6.68 grams. 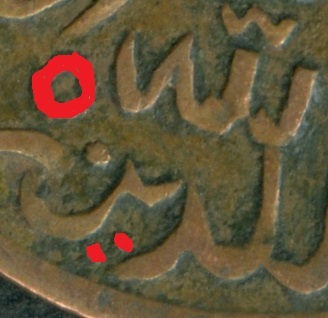 Type7: Same as above coin but extra metal at 5 o' clock below "ربع" at the Date side. Type C of Ad-Din style. Weight 6.64 grams. 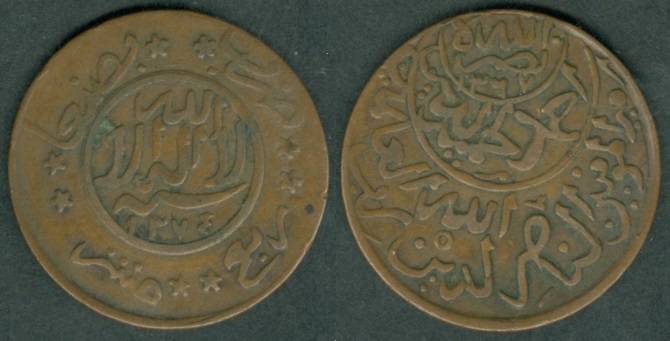 Same as above coin with Type D of Ad-Din style. Weight 6.76 grams. 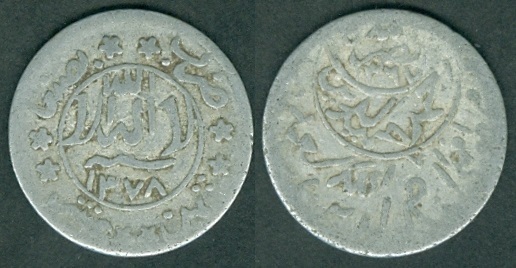 Same as above coin with Type E of Ad-Din style. Weight 6.75 grams. Type8: Gap in the center of the inner circle legends. 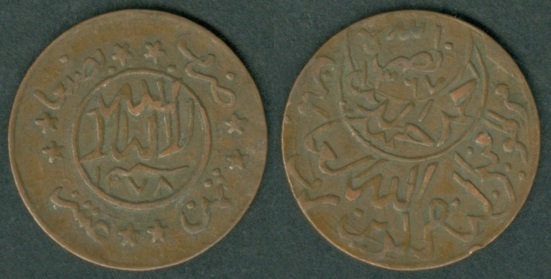 Type B of Ad-Din style. Weight 6.66 grams. 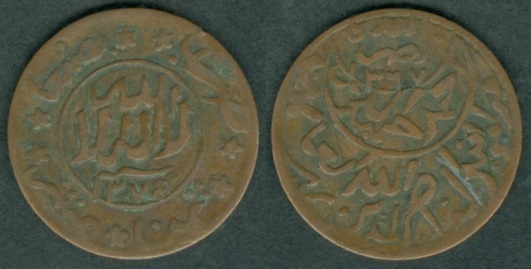 Same as above coin with Type C of Ad-Din style. Weight 6.76 grams. Type9: The word "Sannah" (wave symbol) and Date are smaller in size within the circle. 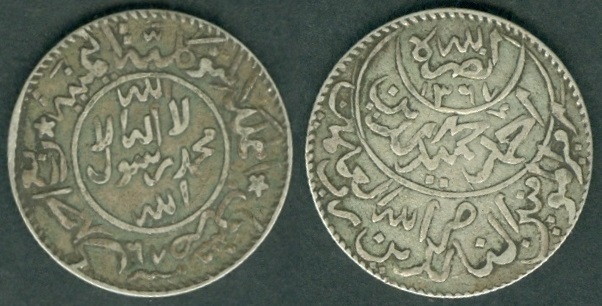 Extra metal at 5 o' clock below "ربع" at the Date side. Type D of Ad-Din style. Weight 6.66 grams. Year: AH 1375/4 (1955). Weight: 6.17 g. Alignment: Coin. Mintage: N.A. Note: Overlapped date type. 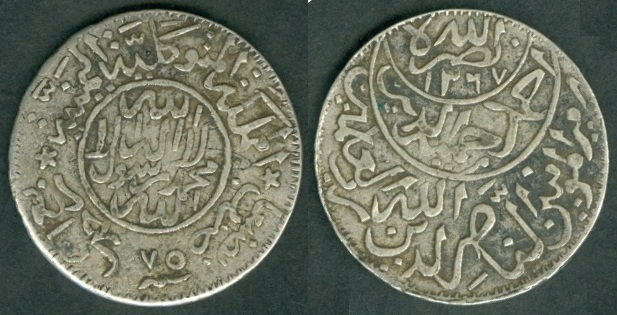 Type A of Ad-Din style. Type2: The word "Sannah" (wave symbol) above Date has two end points at the left. Size and position varies of the legends from above coin within the center circle. Year: AH 1375/4 (1955). Weight: 6.16 g. Alignment: Medal. Mintage: N.A. Overlapped date type. Type3: The word "Sannah" (wave symbol) above Date is thinner. The inner circle is cut at the top left side and the legend is outside from the circle. Size and position varies of the legends from above coin within the center circle. Year: AH 1375/4 (1955). Weight: 6.00 g. Alignment: Medal. Mintage: N.A. Overlapped date type. Note: Type F of Ad-Din style. Y#12.2 1/40 Riyal (Buqsha). Year: AH 1371 - 1380. Mintage Years: AH1371, AH1374, AH1375, AH1376 (also exists with accession date 1376 instead of 1367), AH1377/6 (exists with accession date 1376 instead of 1367), AH1377, AH1378/5, 1379/7, AH1380/79 and AH1380 (1951-1960). 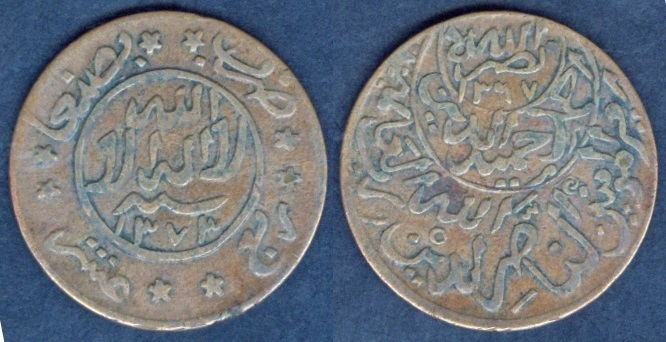 This type has same physical specifications and details written as Y#12.1 but has small "بصنعاء" (at Sana'a) written on the coins. Year: AH 1371 (1951). Weight: 4.69 g. Diameter: 25.50 mm. Mintage: N.A. 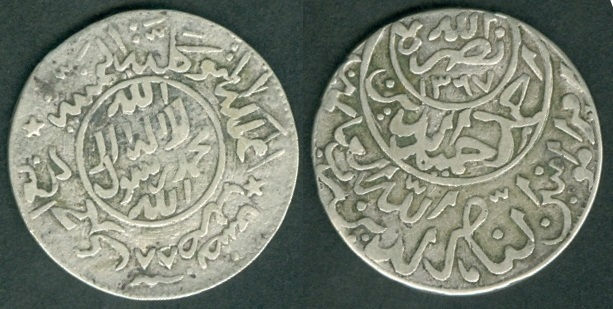 Note: Type A of Ad-Din style but dots tilted right downwards. The word "Sannah" (wave symbol) above Date has two end points at the right. Year: AH 1374 (1954). Weight: 6.62 g. Mintage: N.A. Note: The legends in the center circle have different positions if compared with all other types of Y#12.1. Type1: Small "Sananh" (wave symbol) above date. Small center circle. Year: AH 1375 (1955). Weight: 6.14 g. Alignment: Coin. Mintage: N.A. Type2: Large "Sananh" (wave symbol) above date. Normal center circle. Year: AH 1375 (1955). Weight: 5.89 g. Alignment: Rotated. Mintage: N.A. 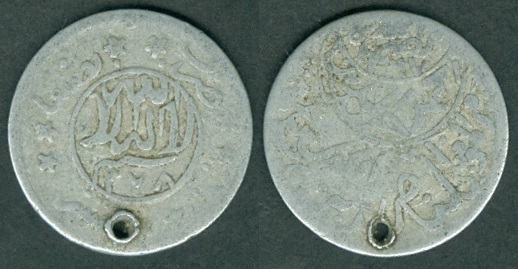 Note: Type F of Ad-Din style with silver wash.
Type1: Digit "1" in Date touching the end of word "Sananh" (wave symbol). Large date. Year: AH 1376 (1956). Weight: 6.17 g. Mintage: N.A. Type2: The word "Sananh" (wave symbol) just above the Date. Small date. Year: AH 1376 (1956). Weight: 6.14 g. Mintage: N.A. 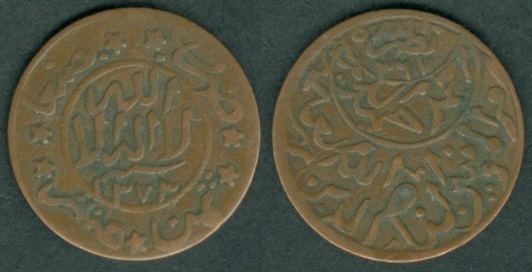 Type1: Type C of Ad-Din style. Year: AH 1377/6 (1957). Weight: 4.69 g. Mintage: N.A. Note: Overlapped date type. This coin is slightly rotated. Type2: Type D of Ad-Din style. Year: AH 1377/6 (1957). Weight: 6.18 g. Mintage: N.A. Type3: Type F of Ad-Din style. Year: AH 1377/6 (1957). Weight: 6.11 g. Mintage: N.A. Note: Overlapped date type. 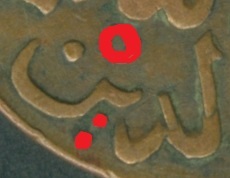 Water Drop symbol instead of stroke (/) below "Al-Nasir" on Accession Date side. Year: AH 1379/7 (1959). Weight: 6.23 g. Mintage: N.A. Note: Overlapped date type. This coin is slightly rotated. Type F of Ad-Din style. Year: AH 1380/77 (1960). Weight: 6.17 g. Mintage: N.A. Note: Overlapped date type. 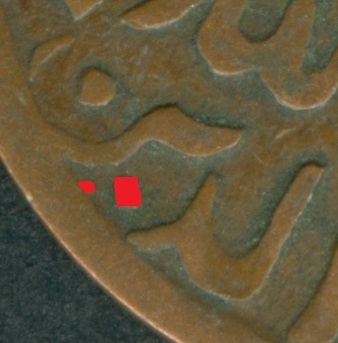 Metal traces which are highlighted in red above. shows that 1380 coin to be made of 1379 die if looked under magnifying glass. Type F of Ad-Din style. Y#12.3 1/40 Riyal (Buqsha). Year: AH 1371. Mintage Years: One year type. 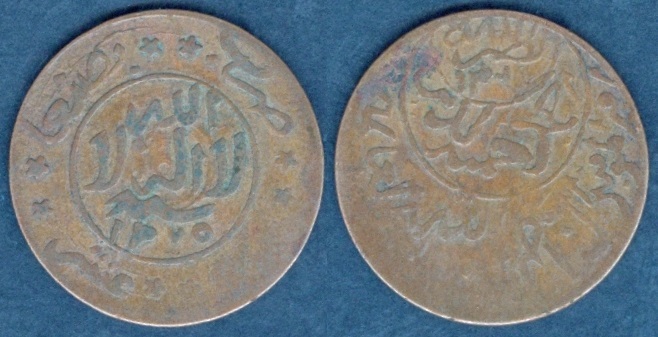 This type has same physical specifications and details written as Y#12.1 with large "بصنعاء" (at Sana'a) but the word "Sannah" (wave symbol) above Date is missing. Year: AH 1371 (1951). Weight: 5.83 g. Diameter: 26.00 mm. Mintage: N.A. Y#12a.1 1/40 Riyal (Buqsha). Year: AH 1371 - 1377. Weight 2.15 grams. Metal: Aluminum. Diameter: 26.50 mm. Edge: Plain. Alignment: Medal. Mint: Sana'a, Yemen. Mintage: N/A. Mintage Years: AH1371, AH1373, AH1374, AH1375 and AH1377 (1951, 1953-1955 and 1957). 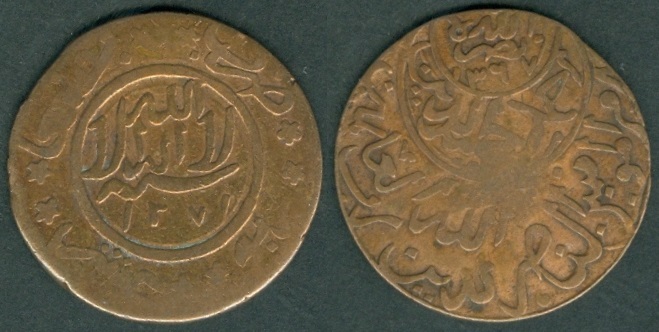 It has the same description as Y#12.1 and having large "بصنعاء" (at Sana'a) written on the coins. Year: AH 1374 (1954). Weight: 2.10 g.
Year: AH 1375 (1955). Weight: 2.14 g. Alignment: Rotated. Type2: Short "Sannah" (wave symbol) above date with thin center circle. Year: AH 1375 (1955). Weight: 2.14 g. Alignment: Coin. Type3: Short "Sannah" (wave symbol) above date with thick center circle. The size and position of legend in the center circle differs from the above coin. Normal Accession Date. Year: AH 1375 (1955). 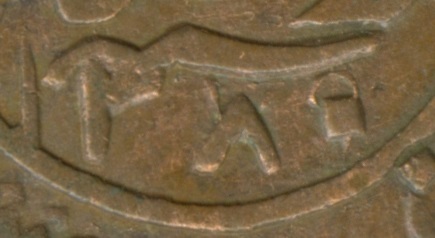 Weight: 2.13 g.
Type4: Short "Sannah" (wave symbol) above date with thick center circle. Thick Accession Date. Year: AH 1375 (1955). Weight: 2.04 g.
Note: Part of ex-jewelry therefore has one hole near the edge. Y#12a.2 1/40 Riyal (Buqsha). Year: AH 1375 - 1377. Weight 2.15 grams. Metal: Aluminum. Diameter: 26.50 mm. Edge: Plain. Alignment: Medal. Mint: Sana'a, Yemen. Mintage: N/A. 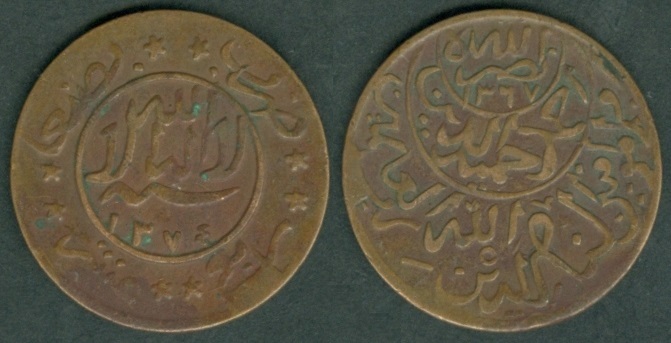 Mintage Years: AH1375, 1376, 1377/6 and AH1377 (1955-1957). 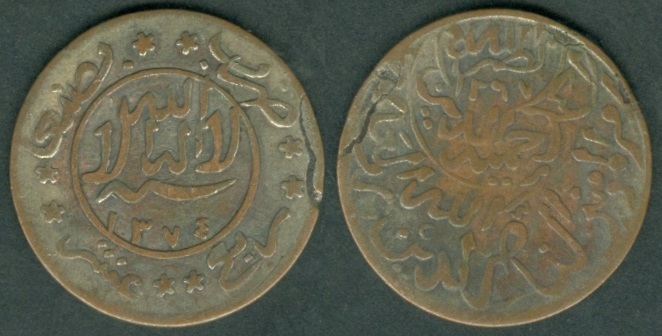 It has the same description as Y#12.2 and having small "بصنعاء" (at Sana'a) written on the coins. Type1: Thick edge. Traces of Reeded edge. Type1: Thin edge. Some minor difference in the legend. Traces of Reeded edge. Year: AH 1375 (1955). Weight: 2.05 g.
Year: AH 1376 (1956). Weight: 2.06 g. Alignment: Rotated. 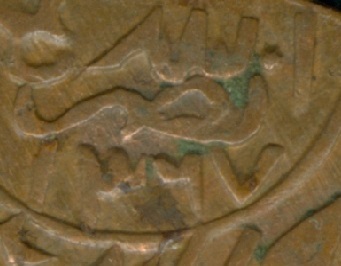 Type2: Small Date with Sannah (wave symbol) just above the Date. Year: AH 1376 (1956). 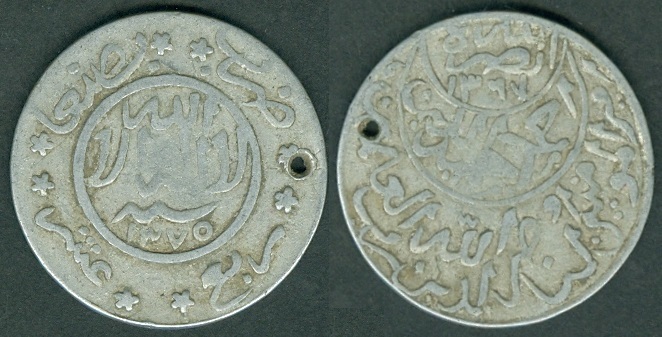 Weight: 2.12 g.
Year: AH 1377/6 (1957). Weight: 2.12 g. Diameter: 25.50 mm. Year: AH 1377 (1957). Weight: 2.12 g.
Y#19 1/40 Riyal (Buqsha). Year: ND (1956). Weight 2.00 grams. Metal: Aluminum. Diameter: 27.00 mm. Edge: Plain. Alignment: Medal. Mint: Lebanon. 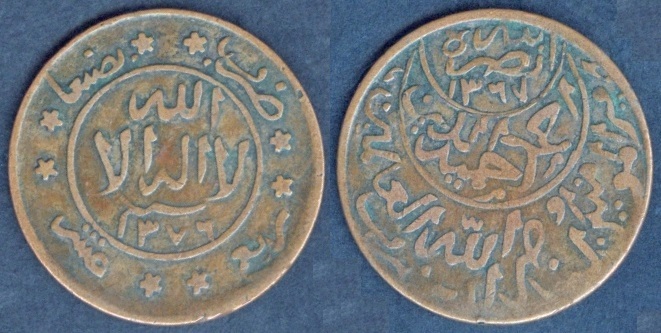 Obverse: "لا اله الا الله" (There is no God except Allah) written at the top. One stars on eac side. 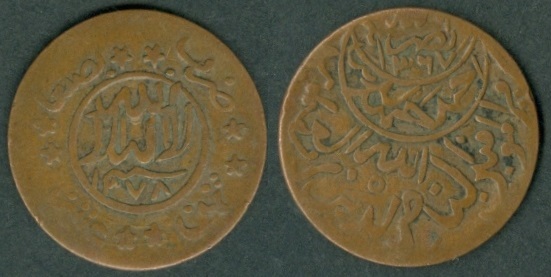 "ضرب بصنعاء" (Struck at Sana'a) written at the bottom right side. 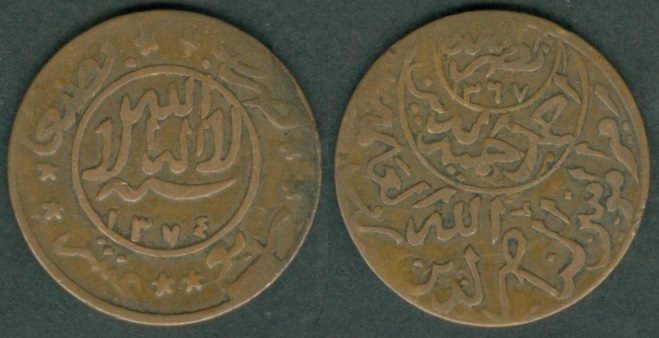 Value "ربع عشر أحمدي" (Ahmadi Quarter of one tenth = 1/40) written at the bottom left side. Accession Date AH 1367 written at the bottom. Tree in the center with water waves below it, "B" written on the left side and "فر" on the right side, all within the center circle. Year: ND. Weight: 1.95 g.
Y#13 1/16 Riyal. Year: AH 1367 - 1374. Weight 1.65 grams. Metal: Silver. Diameter: 5 sided; 16.00 mm x 15.00 mm. Edge: Plain. Alignment: Medal. Mint: Sana'a, Yemen. 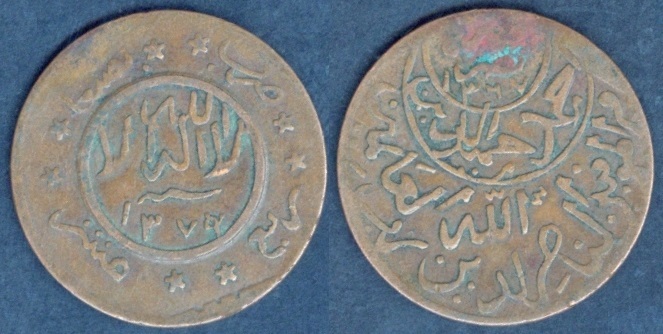 Obverse: "لا اله الا الله" (There is no God except Allah) written in center circle. 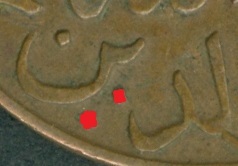 "ضرب بصنعاء" (Struck at Sana'a) written at the top with one stars between these two words. Total 4 stars outside center circle. 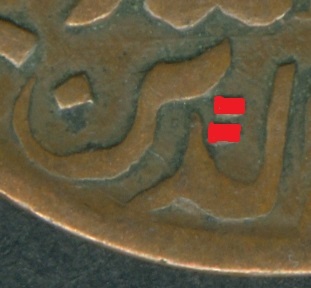 Value "نصف ثمن" (Half of one eighth = 1/16) written at the bottom with one Star between these two words. 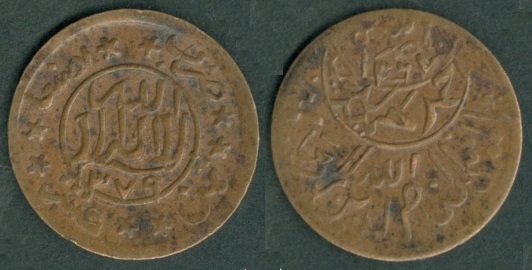 "سنة" (Year) written above Date. 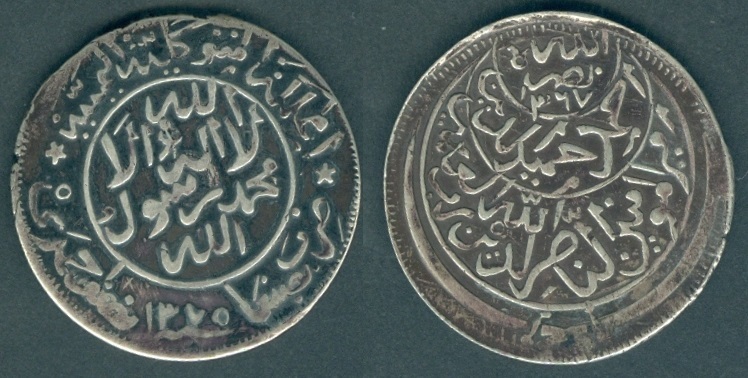 Reverse: "نصره الله" (May Allah assist him) written at the top crescent with Accession Date AH 1367. 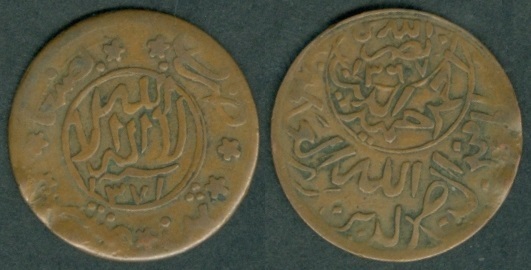 "أحمد حميد الدين" (Ahmad Hamidaddin) written in the center crescent. "أمير المؤمنين، الناصر لدين الله رب العلمين" [Amir al-Mumenin al-Nasir Ad-Din Allah Rab 'Alamin (Commander of the Faithful, The Victor for the Religion of Allah, the lord of the worlds)] written in the large bottom crescent. Mintage: N/A. Mintage Years: AH1367, AH1368, AH1371 and AH1374 (1948-1949, 1951 and 1954). Year: AH 1368 (1949). Weight: 1.62 g. Mintage: N.A. 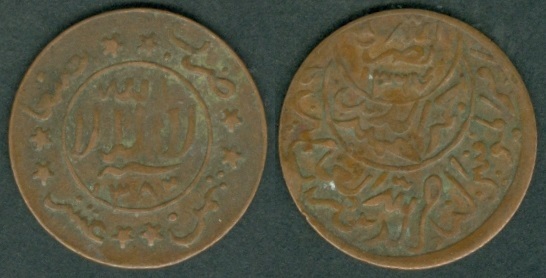 Type2: The Date on both side has different size and position than the above coin. Year: AH 1368 (1949). Weight: 1.63 g. Mintage: N.A. Year: AH 1371 (1951). Weight: 1.72 g. Mintage: N.A. Y#14 1/8 Riyal. Year: AH 1367 - 1380. Weight 3.25 grams. Metal: Silver. Diameter: 5 sided; 18.00 mm x 17.00 mm. Edge: Plain. Alignment: Medal. Mint: Sana'a, Yemen. 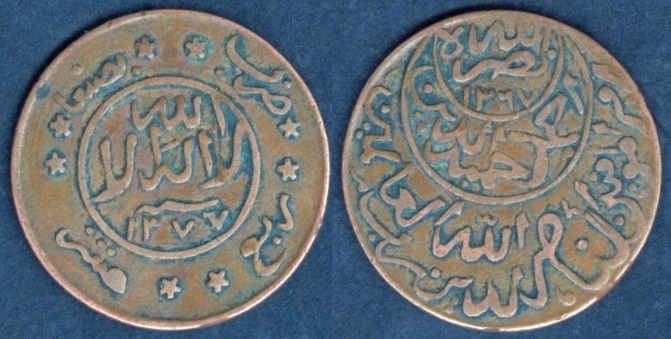 Obverse: "لا اله الا الله" (There is no God except Allah) written in center circle. 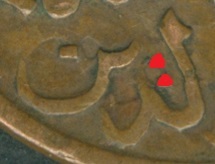 "ضرب بصنعاء" (Struck at Sana'a) written at the top with one stars between these two words. Total 4 stars outside center circle. 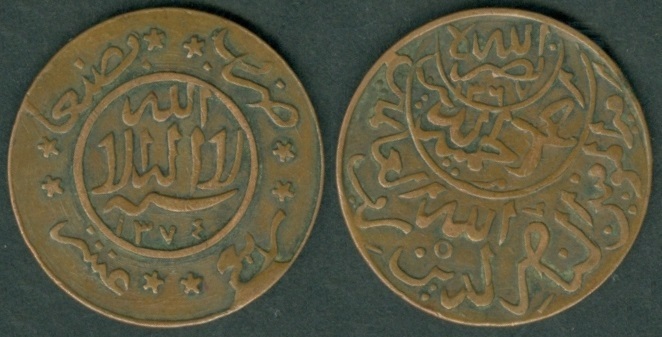 Value "ثمن احمدى" (One eighth Ahmadi Riyal = 1/8) written at the bottom with one Star between these two words. 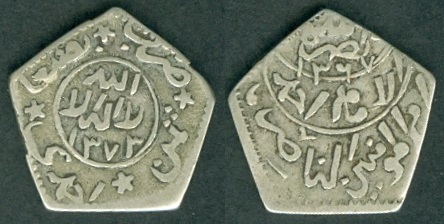 "سنة" (Year) written above Date. 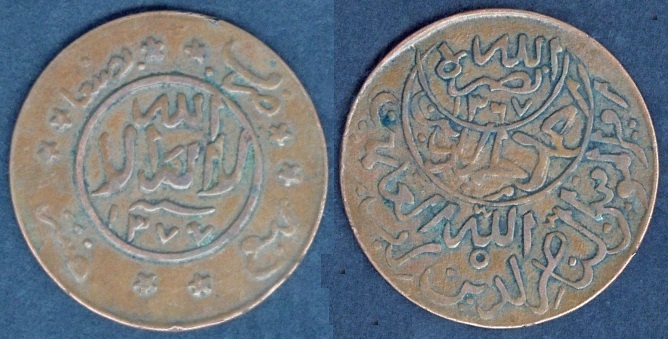 Reverse: "نصره الله" (May Allah assist him) written at the top crescent with Accession Date AH 1367. "أحمد حميد الدين" (Ahmad Hamidaddin) written in the center crescent. "أمير المؤمنين، الناصر لدين الله رب العلمين" [Amir al-Mumenin al-Nasir Ad-Din Allah Rab 'Alamin (Commander of the Faithful, The Victor for the Religion of Allah, the lord of the worlds)] written in the large bottom crescent. Mintage: N/A. Mintage Years: AH1367, AH1368, AH1370, AH1371, AH1372, AH1373, AH1374, AH1375/1, AH1379/x, AH1379/5, AH1379 and AH1380 (1948-1960). Type1: Small center circle and Thick date with digit "1" overlapping on the circle. Year: AH 1368 (1949). Weight: 3.21 g. Mintage: N.A. Type2: Normal center circle and proper Date. Year: AH 1368 (1949). Weight: 3.24 g. Mintage: N.A. Type1: Round Zero in Date. Year: AH 1370 (1950). Weight: 3.17 g. Mintage: N.A. Type2: Square Zero in Date. 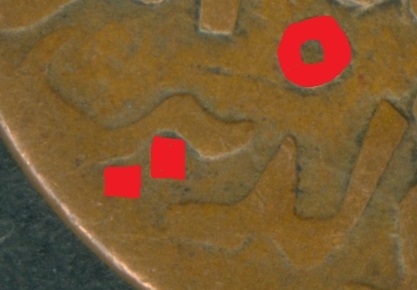 The characters in the center circle is having less thickness and position of some characters also varies from above coin. Year: AH 1370 (1950). Weight: 3.31 g. Mintage: N.A. Type1: All straight digits in Date. Large Date. Year: AH 1371 (1951). Weight: 2.95 g. Mintage: N.A. Type2: Last digit "1" is tilted to much extend in Date. Year: AH 1371 (1951). Weight: 3.44 g. Mintage: N.A. Type3: Digit "13" is tilted in Date. 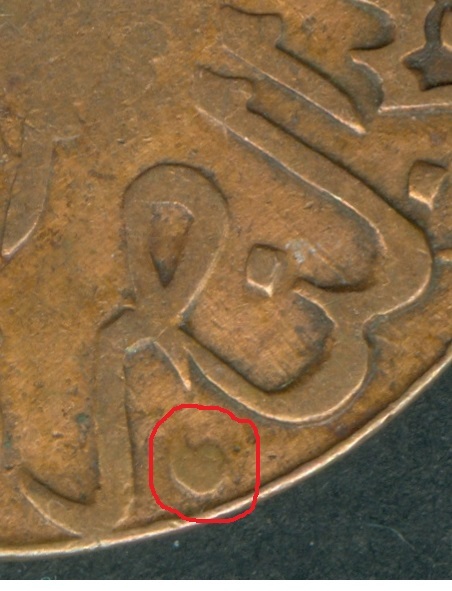 Very small digit "1" in Accession Date. Year: AH 1371 (1951). Weight: 2.86 g. Mintage: N.A. Type1: Digit "3" is cutting the center circle. Also the character at the top right is cutting the center circle. Year: AH 1372 (1952). Weight: 3.17 g. Mintage: N.A. Type2: Date and legends all within the center circle. The characters thickness, size and position of some characters in the center circle also varies from above coin. Year: AH 1372 (1952). Weight: 3.46 g. Mintage: N.A. Year: AH 1373 (1953). Weight: 3.43 g. Mintage: N.A. Year: AH 1374 (1954). Weight: 3.41 g. Mintage: N.A. 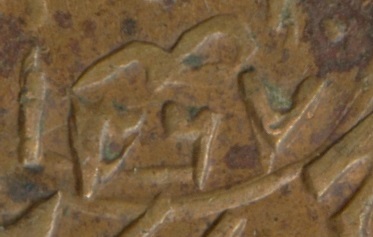 Type2: Small first digit "1" in date. Position and size of legends on both sides varies from the above coin. Year: AH 1374 (1954). Weight: 3.08 g. Mintage: N.A. Year: AH 1380 (1960). Weight: 3.21 g. Mintage: N.A. Note: Square dot in Date. Y#15 1/4 Riyal. Year: AH 1367 - 1380. Weight 7.00 grams. Metal: Silver. Diameter: 24.50 mm. Edge: Reeded. Alignment: Medal. Mint: Sana'a, Yemen. 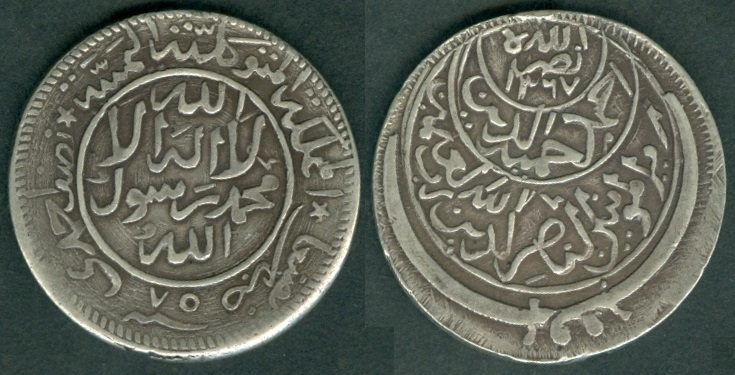 Obverse: "المملكة المتوكلية اليمنية" (Mutawakkilite Kingdom of Yemen) written at the top. "لا اله الا الله" (There is no God except Allah) written in center circle. 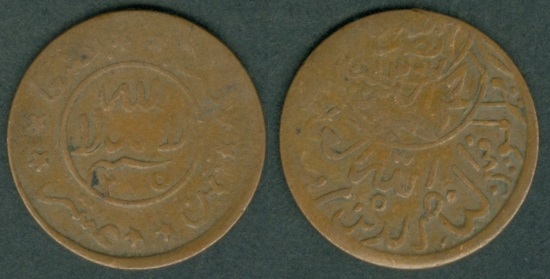 "ضرب بصنعاء" (Struck at Sana'a) written at the bottom right side. 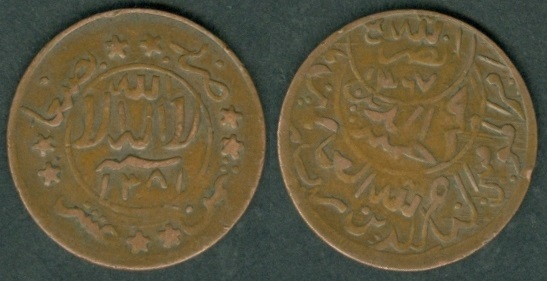 Value "ربع احمدى" (Quarter Ahmadi) written at the bottom left side. One star on each side (total two stars in outer circle). 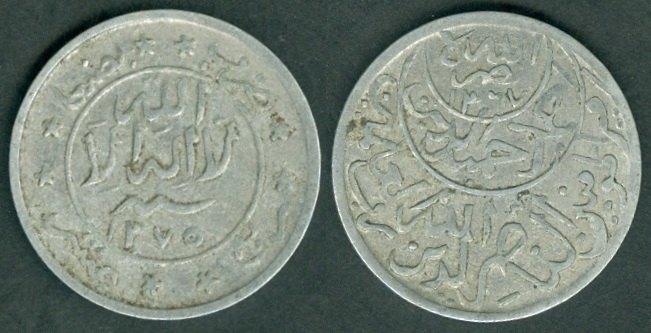 "سنة" (Year) written below the two digit Date at the bottom. 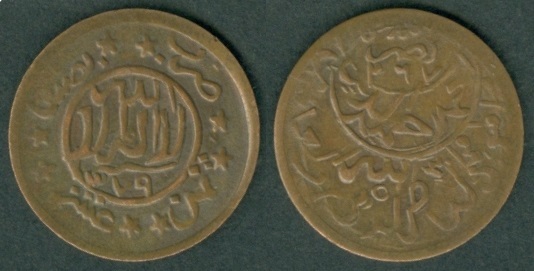 Reverse: "نصره الله" (May Allah assist him) written at the top crescent with Accession Date AH 1367. 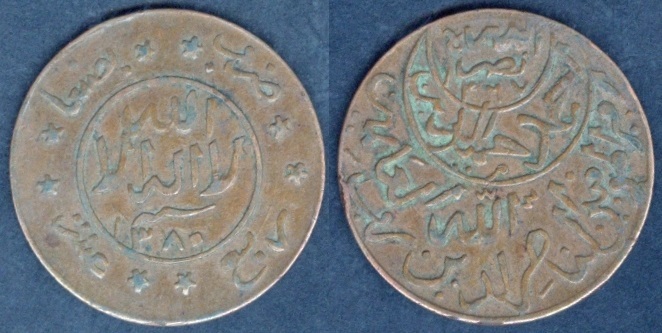 "أحمد حميد الدين" (Ahmad Hamidaddin) written in the center crescent. "أمير المؤمنين، الناصر لدين الله رب العلمين" [Amir al-Mumenin al-Nasir Ad-Din Allah Rab 'Alamin (Commander of the Faithful, The Victor for the Religion of Allah, the lord of the worlds)] written in the large bottom crescent. Mintage: N/A. Mintage Years: AH(13)67, AH(13)68, AH(13)70, AH(13)71/68, AH(13)71/0, AH(13)71, AH(13)72, AH(13)74, AH(13)75/3, AH(13)75, AH(13)77/5 and AH(13)80 [1948-1960]. on the coin. 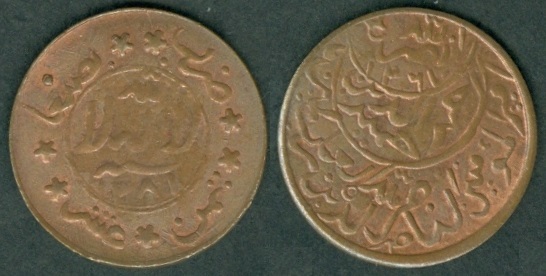 Most of 1/4, 1/2 and 1 Riyal coins are noticed to be part of ex-jewelry and later the clips were removed for coin collectors. 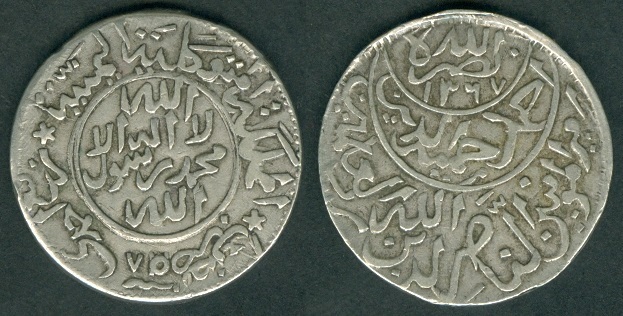 Type1: Abstract flying bird symbol over "Ahmad" on Reverse side. Year: AH (13)67 . Weight: 6.80 g. Edge: Reeded. Mintage: N.A. Note: Not part of ex-jewelry. 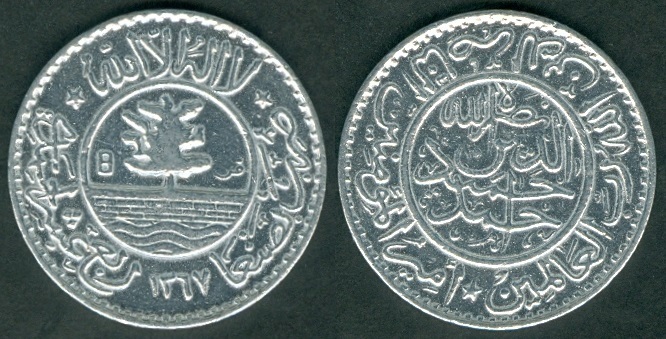 Type2: Abstract flying bird symbol over "Al-Nasir" on Reverse side. Year: AH (13)67 . Weight: 6.44 g. Edge: Reeded. Mintage: N.A. Year: AH (13)68 . Weight: 6.65 g. Edge: traces of Reeded edge. Mintage: N.A. Year: AH (13)71/68 . Weight: 7.05 g. Edge: Reeded. Mintage: N.A. Note: Overlapped digits in Date 71/68. Not part of ex-jewelry. Year: AH (13)71/0 . Weight: 6.85 g. Edge: traces of Reeded edge. Mintage: N.A. Note: Overlapped digits in Date 71/70. Not part of ex-jewelry. Type1: Abstract flying bird symbol top right of "Al-Nasir". Legends within the center circle. Year: AH (13)72 . Weight: 7.04 g. Edge: Reeded. Mintage: N.A. Type2: No abstract flying bird symbol around "Al-Nasir". Legends at the left side touching the circle within the center circle. The digit "2" in year "72" below the legend. The end of word Ahmad at 7 O'clock creates the inner circle. Year: AH (13)72 . Weight: 6.78 g. Edge: Reeded. Mintage: N.A. Note: Part of ex-jewelry. Clip removed and 50% of the top edge is plain. 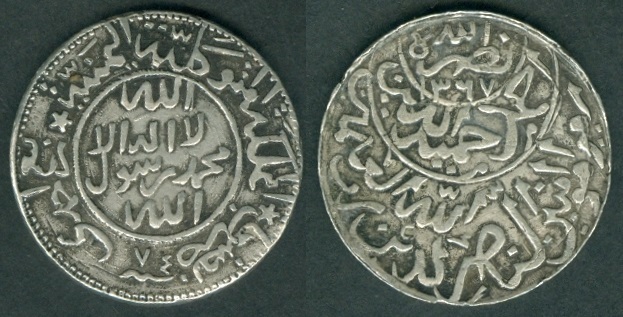 Type3: Abstract flying bird symbol top right of "Al-Nasir" and circle above "Ad-Din". 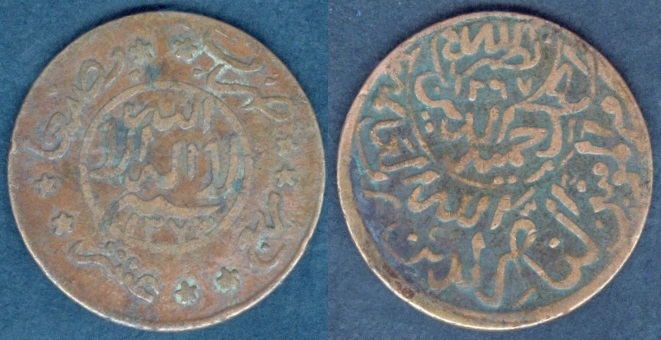 Obverse side same as Type2. Year: AH (13)72 . Weight: 6.92 g. Edge: Reeded. Mintage: N.A. Note: Part of ex-jewelry. Clip removed at the top. 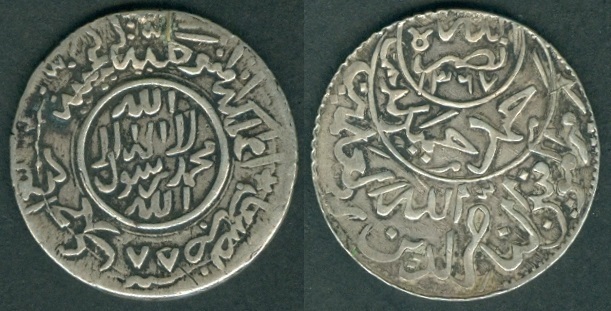 Type4: Abstract flying bird symbol at the top of "Al-Nasir" and no circle above "Ad-Din". 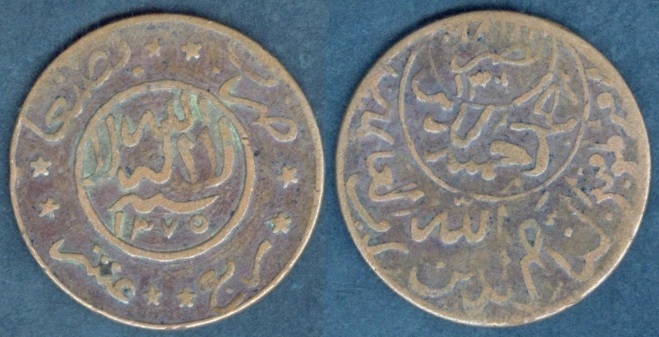 Obverse side same as Type2. Year: AH (13)72 . Weight: 6.48 g. Edge: traces of Reeded edge. Mintage: N.A. Diameter: 25.00 mm. 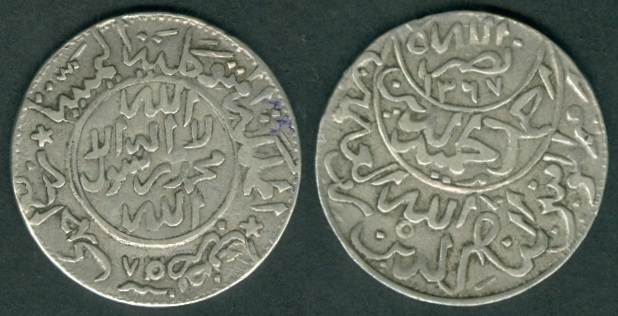 Type1: Abstract flying bird symbol at the top of "Al-Nasir" "Ad-Din" style having top circle. The legends within the center circle are well centered. Year: AH (13)74 . Weight: 7.14 g. Edge: Plain. Mintage: N.A. Note: Part of ex-jewelry. Clip removed. Type2: The size and position of legend differs from the above coin on both sides. The legends within the center circle is more towards right side. Extra metal at the Date side. 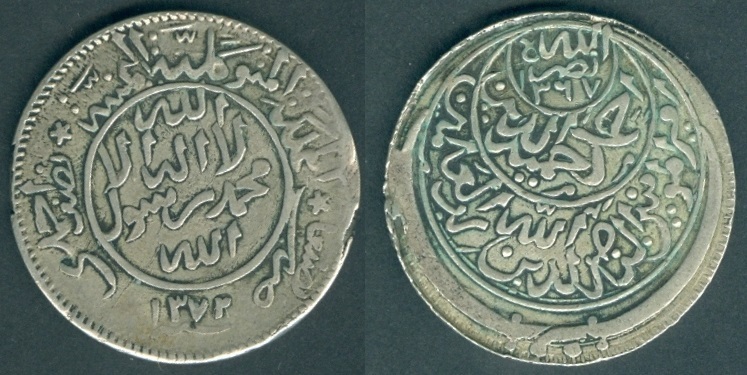 The "Ad-Din" style on this coin is without top circle. Slightly larger than above coin. Year: AH (13)74 . Weight: 6.46 g. Diameter: 25.50 mm. Edge: Plain; small traces of Reeded edge. Mintage: N.A. Note: Part of ex-jewelry. Clip removed from top and bottom ends. 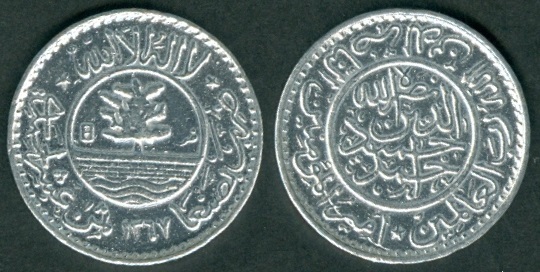 Type3: No abstract bird on "Al-Nasir" and no circle in "Ad-Din". The legends within the center circle is touching the circle at the top and left side. Year: AH (13)74 . Weight: 6.91 g. Edge: Plain. Mintage: N.A. Note: Part of ex-jewelry. Clip removed from top end. 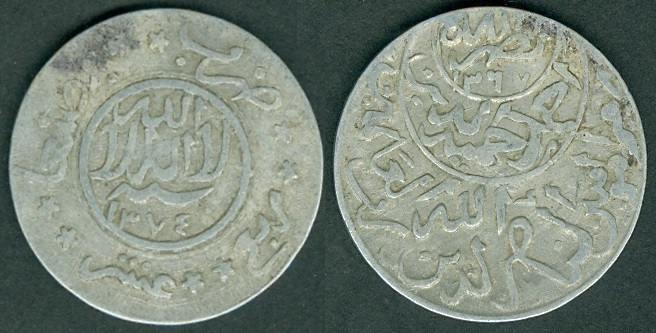 Type4: The Obverse side is Type3 (legends touching circle) and the Reverse side is Type1 (Abstract flying bird symbol above "Al-Nasir" and circle above "Ad-Din"). Year: AH (13)74 . Weight: 6.14 g. Edge: Plain. Mintage: N.A. 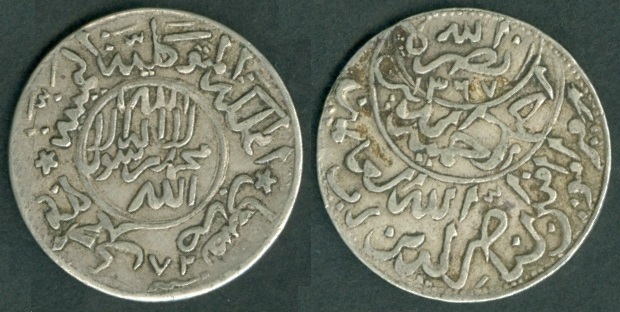 Type5: Abstract flying bird symbol at the top right of "Al-Nasir" "Ad-Din" style having top circle. The legends within the center circle are well centered but differ from Type1. Year: AH (13)74 . Weight: 6.64 g. Edge: traces of Reeded edge. Mintage: N.A. 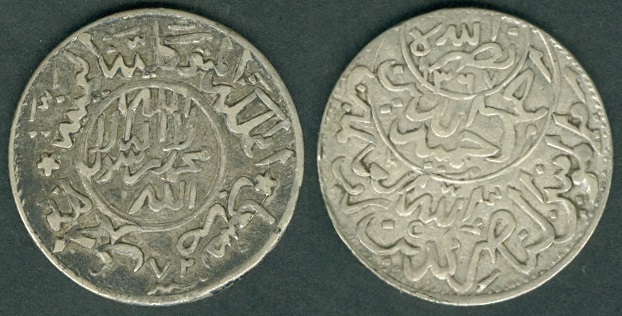 Type1: No abstract bird on "Al-Nasir" and no circle in "Ad-Din". Year: AH(13)75/3 . Weight: 6.64 g. Edge: Plain. Mintage: N.A. Overlapped digits in Date 75/3 type. 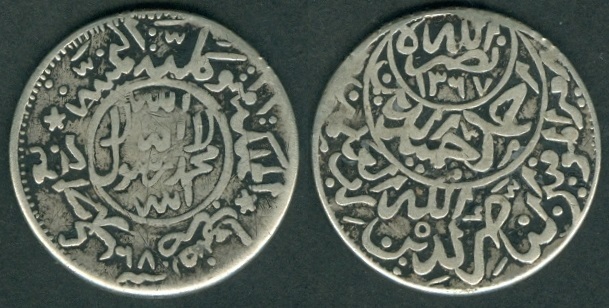 Type2: Abstract bird at the top of "Al-Nasir" and circle in "Ad-Din". Obverse side same as above. Year: AH(13)75/3 . Weight: 6.78 g. Edge: Plain. Mintage: N.A. Year: AH (13)75 . Weight: 6.72 g. Edge: Plain. Mintage: N.A. Year: AH (13)77/5 . Weight: 6.59 g. Edge: Plain with traces of Reeded edge. Mintage: N.A. Note: Part of ex-jewelry. Clip removed. Overlapped digits in Date 77/5 type. Type2: The size and position of legend in the center circle differs from the above coin. 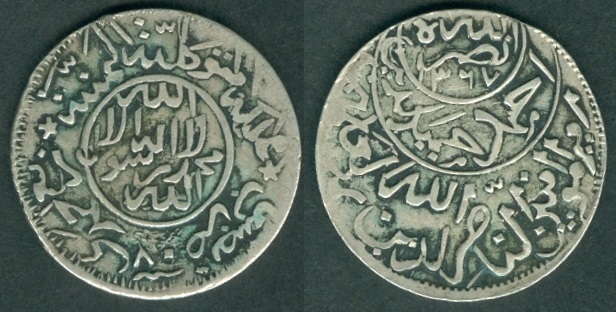 The "Al-Nasir" style on this coin is having water drop symbol instead of stoke at the bottom of the word at the Accession Date side. Year: AH (13)77/5 . Weight: 6.56 g. Edge: Plain with small trace of Reeded edge. Mintage: N.A. 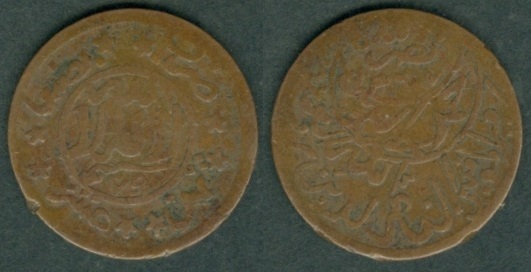 Type3: Obverse side same as Type1. 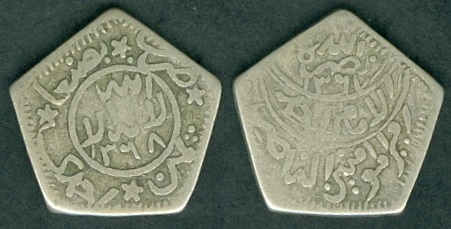 Reverse side has the "w" symbol titled below "Al-Nasir" and stoke below it. Year: AH (13)77/5 . Weight: 6.88 g. Edge: Plain with Reeded edge. Diameter: 24.25 mm. Mintage: N.A. Year: AH (13)80 . Weight: 7.42 g. Edge: Plain with small trace of Reeded edge. Diameter: 24.25 mm. Mintage: N.A. Y#16.1 1/2 Riyal. Year: AH 1367 - 1377. Weight 14.00 grams. Metal: Silver. Diameter: 30.00 mm. Edge: Reeded. Alignment: Medal. Mint: Sana'a, Yemen. 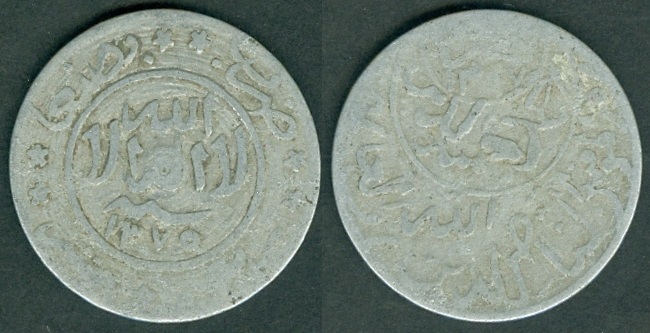 Obverse: "المملكة المتوكلية اليمنية" (Mutawakkilite Kingdom of Yemen) written at the top. "لا اله الا الله" (There is no God except Allah) written in center circle. 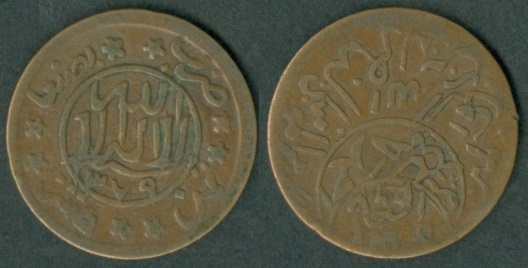 "ضرب بصنعاء" (Struck at Sana'a) written anti clock-wise at the bottom right side. 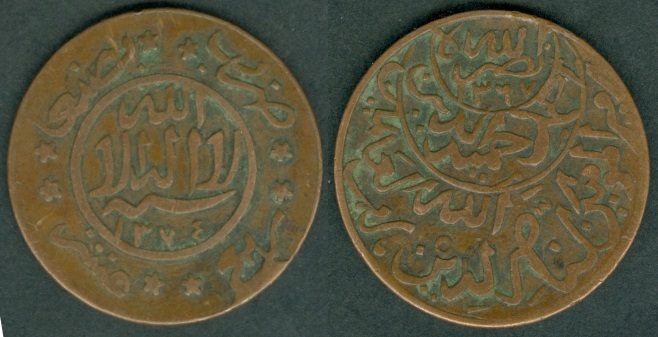 Value "نصف احمدى" (Half Ahmadi) written anti clock-wise at the left side. One star on each side (total two stars in outer circle). 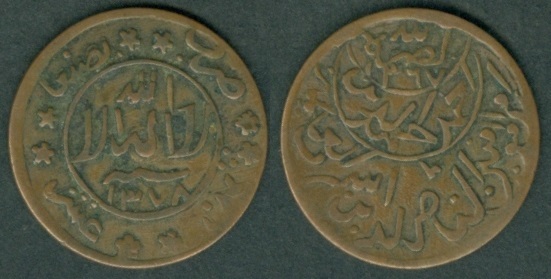 "سنة" (Year) written below Date at the bottom. 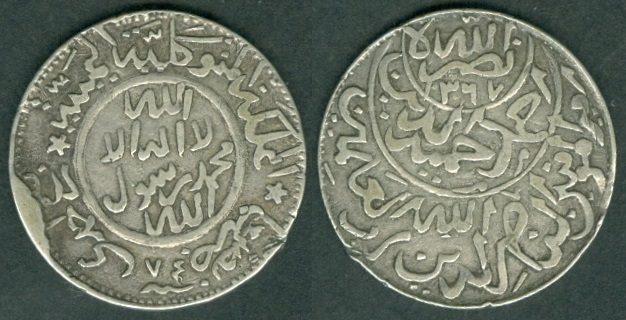 Reverse: "نصره الله" (May Allah assist him) written at the top crescent with Accession Date AH 1367. 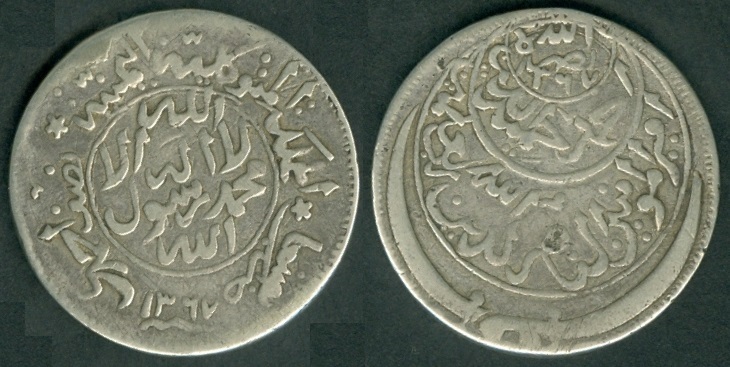 "أحمد حميد الدين" (Ahmad Hamidaddin) written in the center crescent. "أمير المؤمنين، الناصر لدين الله رب العلمين" [Amir al-Mumenin al-Nasir Ad-Din Allah Rab 'Alamin (Commander of the Faithful, The Victor for the Religion of Allah, the lord of the worlds)] written in the large bottom crescent. Mintage: N/A. Mintage Years: AH1367, AH1368, AH1369, AH1370, AH1371, AH1372/68, AH1373, AH(13)75 and AH1377 (1948-1957). Note: Most of these coins are noticed to be part of ex-jewelry and later the clips were removed for coin collectors. Year: AH 1367 (1948). Weight: 13.50 g. Diameter: 29.50 mm. Edge: Plain. Mintage: N.A. Part of ex-jewelry. Clip removed. Year: AH 1368 (1949). Weight: 13.52 g. Edge: Reeded. Mintage: N.A. Part of ex-jewelry. Clip removed. 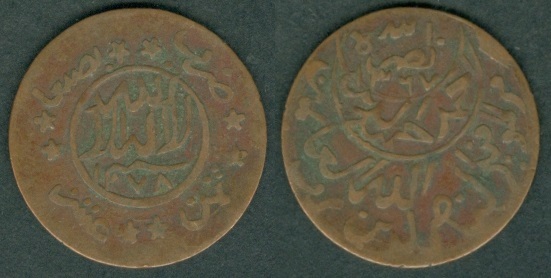 Note: Another variety also exists in this date having thick and long "3" in Accession and missing inverted comma after the last word "Al-Din" at the left side of second line on Reverse side. Year: AH 1369 (1950). Weight: 13.42 g. Edge: Plain. Mintage: N.A. Part of ex-jewelry. Clip removed. Year: AH 1370 (1950). Weight: 13.59 g. Edge: Plain with small trace of Reeded edge. Diameter: 29.50 mm. Alignment: Rotated (1 o' clock). Mintage: N.A. Year: AH 1371 (1951). Weight: 14.00 g. Edge: Plain with small trace of Reeded edge. Diameter: 29.00 mm. Mintage: N.A. Year: AH 1372 (1952). Weight: 14.26 g. Edge: Plain with small trace of Reeded edge. Diameter: 29.50 mm. Mintage: N.A. Year: AH 1373 (1953). Weight: 12.55 g. Edge: Plain with small trace of Reeded edge. Mintage: N.A. Part of ex-jewelry. Clip removed. Year: AH (13)75 . Weight: 14.05 g. Edge: traces of Reeded edge. Mintage: N.A. Part of ex-jewelry. Clip removed. 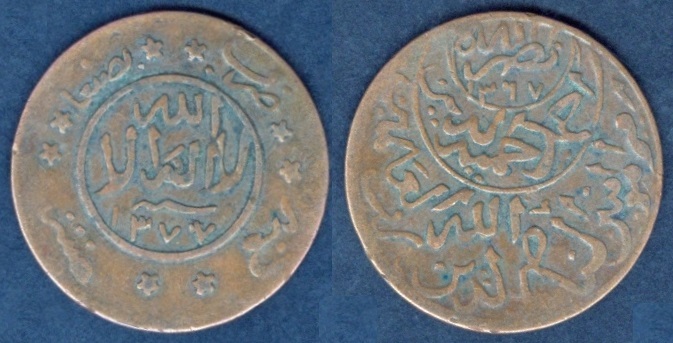 This is only coin of Half Riyal type without complete Year. Y#16.2 1/2 Riyal. Year: AH 1377 - 1382. Weight 14.00 grams. Metal: Silver. Diameter: 30.00 mm. Edge: Reeded. Alignment: Medal. Mint: Sana'a, Yemen. 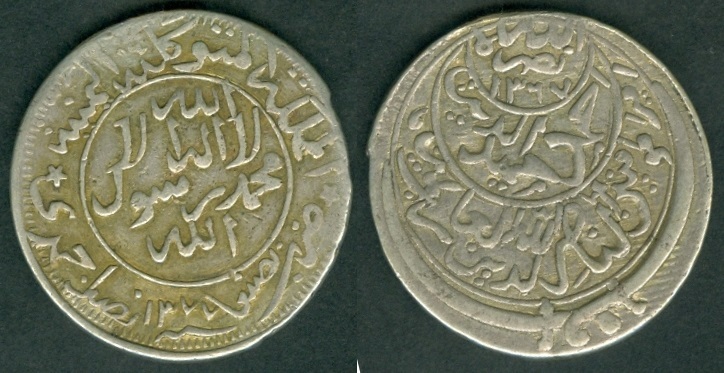 Obverse: "المملكة المتوكلية اليمنية" (Mutawakkilite Kingdom of Yemen) written at the top. "لا اله الا الله" (There is no God except Allah) written in center circle. 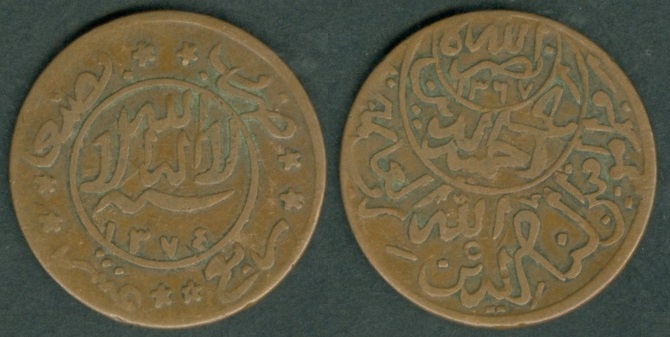 "ضرب بصنعاء" (Struck at Sana'a) written clock-wise at the bottom right side. 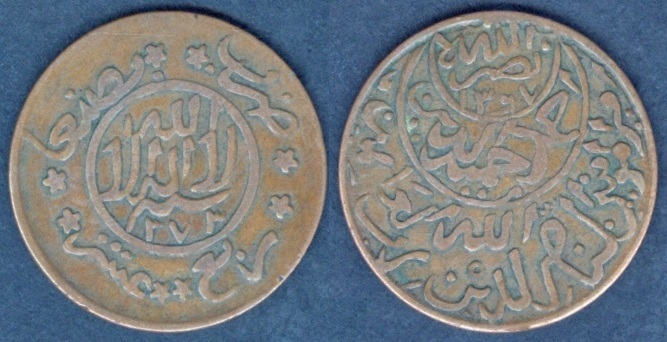 Value "نصف احمدى" (Half Ahmadi) written clock-wise at the left side. One star on each side (total two stars in outer circle). 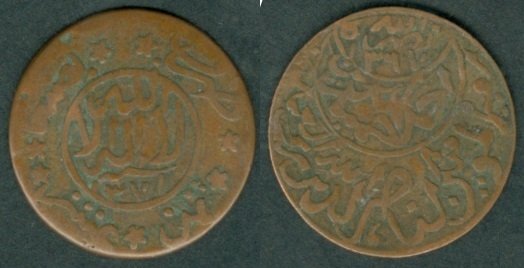 "سنة" (Year) written below Date at the bottom. 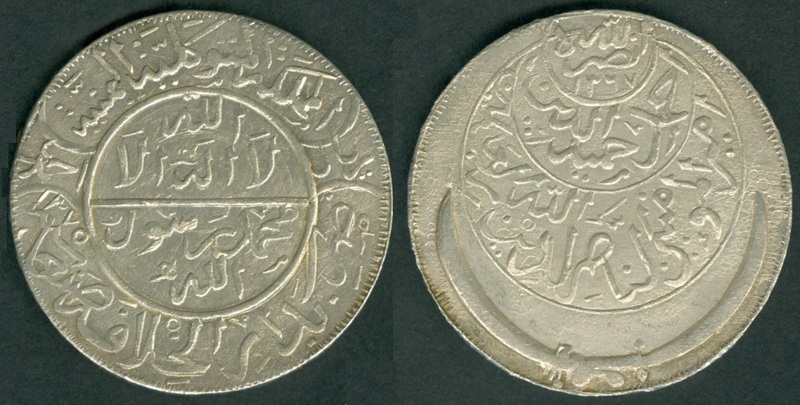 Reverse: "نصره الله" (May Allah assist him) written at the top crescent with Accession Date AH 1367. 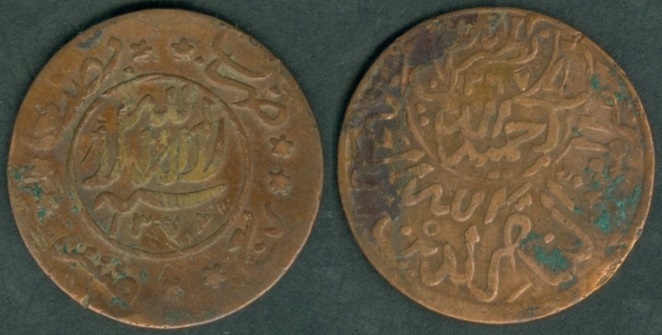 "أحمد حميد الدين" (Ahmad Hamidaddin) written in the center crescent. "أمير المؤمنين، الناصر لدين الله رب العلمين" [Amir al-Mumenin al-Nasir Ad-Din Allah Rab 'Alamin (Commander of the Faithful, The Victor for the Religion of Allah, the lord of the worlds)] written in the large bottom crescent. Mintage: N/A. Mintage Years: AH1375, AH1377, AH1378, AH1379, AH1380, AH1381 and AH1382 (1955 and 1957-1962). Note: Most of these coins are noticed to be part of ex-jewelry and later the clips were removed for coin collectors. Arrangement of legends within the circle and size of circle on Date side varies. These coins were struck over blanks punched from Maria Theresa Thalers. 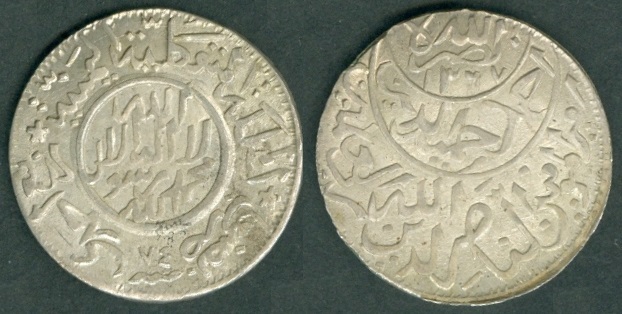 The outer rings are reported to have circulated as currency, but this is doubtful, as they are found only counterstamped “لاغ” (void) in Arabic. 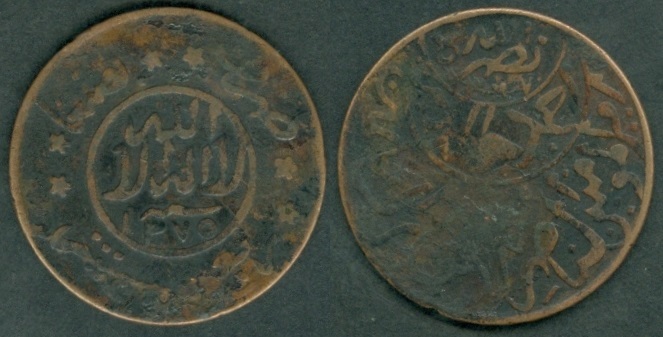 In KM#16.2, "ضرب بصنعاء" (Struck at Sana'a) and Value "نصف احمدى" (Half Ahmadi) are both written clock-wise while in KM#16.1 there are both written anti clock-wise. Year: AH 1375 (1955). Weight: 12.39 g. Diameter: 29.00 mm. Edge: Plain. Mintage: N.A. Note: AH1375 date exists with coin collectors but Krause publication has listed this date as "needs confirmation" under KM#16.1 but actually it belongs under KM#16.2. Year: AH 1377 (1957). Weight: 14.38 g. Diameter: 29.00 mm. Edge: Plain with traces of Reeded edge. Mintage: N.A. Part of ex-jewelry. Clip removed. Year: AH 1378 (1958). Weight: 13.72 g. Diameter: 29.00 mm. Edge: Reeded. Mintage: N.A. Year: AH 1379 (1959). Weight: approx 14.00 g. Diameter: 29.00 mm. Edge: Plain with traces of Reeded edge. Mintage: N.A. 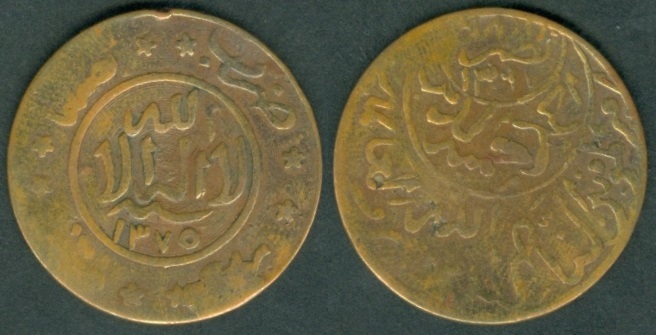 Note: "ضرب بصنعاء" (Struck at Sana'a) and "نصف" (half) written at the bottom on Date side are struck several time. Year: AH 1381 (1961). Weight: 12.36 g. Diameter: 29.50 mm. Edge: mostly Reeded. Alignment: Rotated (1 o' clock). Mintage: N.A. 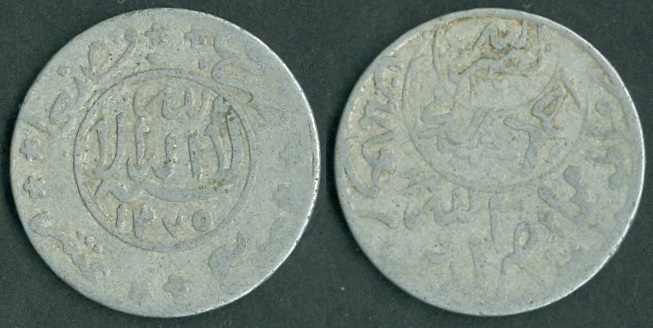 Note: This variety has a dot at the left lower side, base of "1" in the Date 1381. There is also a small horizontal line almost in the center of the circle. Another variety in this date exists, missing both these details. Year: AH 1382 (1962). Weight: 12.68 g. Edge: Plain. Mintage: N.A. Part of ex-jewelry. Clip removed. Note: Another variety in this date exists having a dot overlapping below the last character above the left star on the Obverse side. Y#17 Riyal. Year: AH 1367 - 1377. Weight: 28.00g. Metal: Silver. Diameter: 39.50 mm. Edge: Decorative and Lettering "ا ل م ل ك لله +*+ ا ل ع زلله +*+". These alphabets if combine makes "الملك لله العزلله" (Allah is The King, Allah is Great). Alignment: Medal. Mint: Sana'a, Yemen. 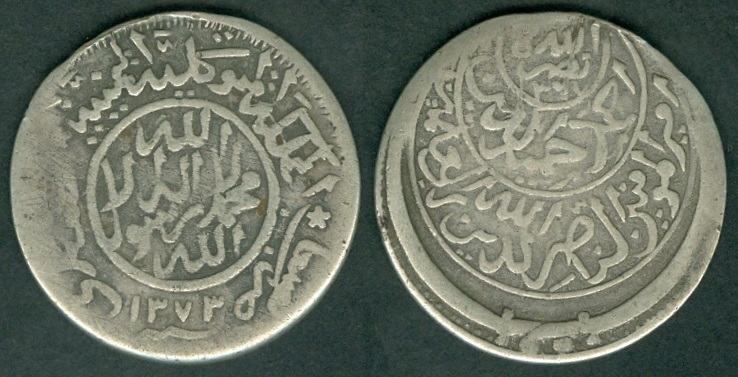 Obverse: "المملكة المتوكلية اليمنية" (Mutawakkilite Kingdom of Yemen) written at the top. 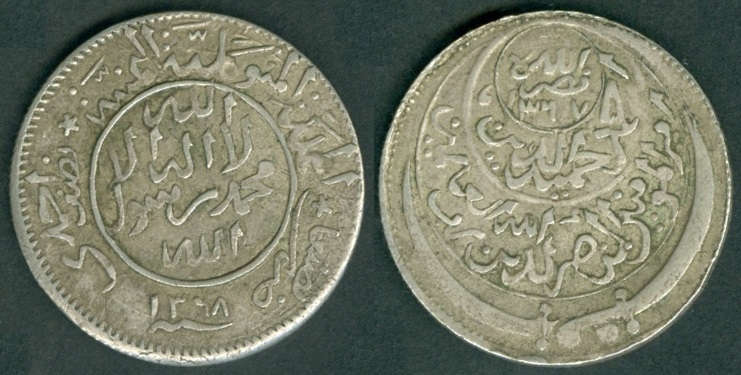 "لا اله الا الله" (There is no God except Allah) written in center circle in the top section and "محمد رسول الله" (Muhammad is the prophet of God) written in the center circle at the bottom section. 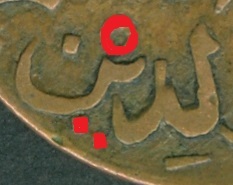 "ضرب بدار الخلافة صنعا اليمن" (Struck at the capital city Sana'a, Yemen with DATE) written at the bottom section outside the center circle. 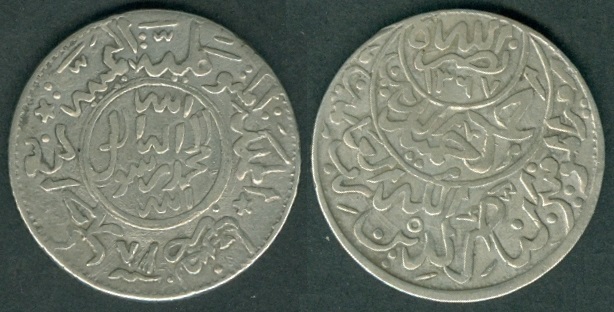 Value "ريال" (Riyal) written at the left side and "احمدى" (Ahmadi) at the right side. 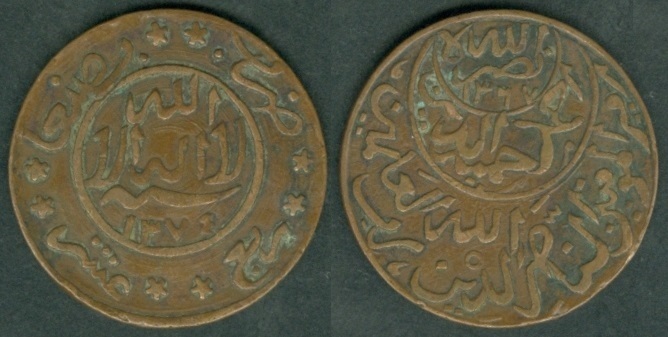 Reverse: "نصره الله" (May Allah assist him) written at the top crescent with Accession Date AH 1367. "أحمد حميد الدين" (Ahmad Hamidaddin) written in the center crescent. "أمير المؤمنين، الناصر لدين الله رب العلمين" [Amir al-Mumenin al-Nasir Ad-Din Allah Rab 'Alamin (Commander of the Faithful, The Victor for the Religion of Allah, the lord of the worlds)] written in the large bottom crescent. 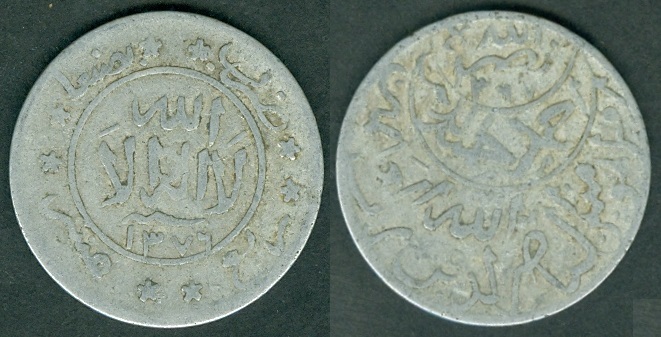 Mintage: N.A Mintage Years: AH1367, AH1370, AH1371, AH1372/68 (requires confirmation), AH1373 (Most AH1373 Riyals appear to be weakly struck from recut AH1372 dies, and the dates are easily confused), AH1374, AH1375, AH1377, AH1378, AH1380 and AH1381 (1949-1961). Note: Most of these coins are noticed to be part of ex-jewelry and later the clips were removed for coin collectors. These are usually found struck over Austrian Maria Theresa Thalers and occasionally over other foreign crowns. 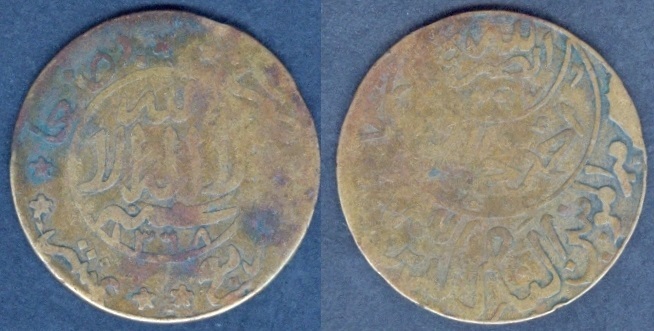 All Y-17s have 1367 in the center obverse. 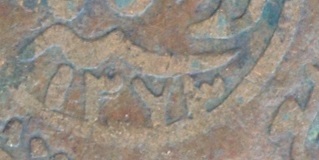 The date for each piece is located in the lower left of the reverse. Varieties exist. Year: AH 1373 (1953). Weight: 26.98 g. Mintage: N.A. Part of ex-jewelry. Clip removed. 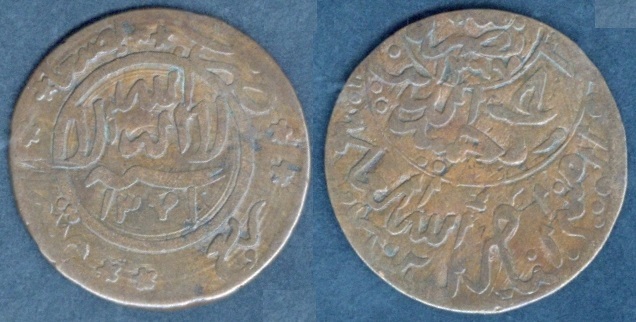 Edge lettering on this coin in my collection is readable when the Date "1373" side it at the top. 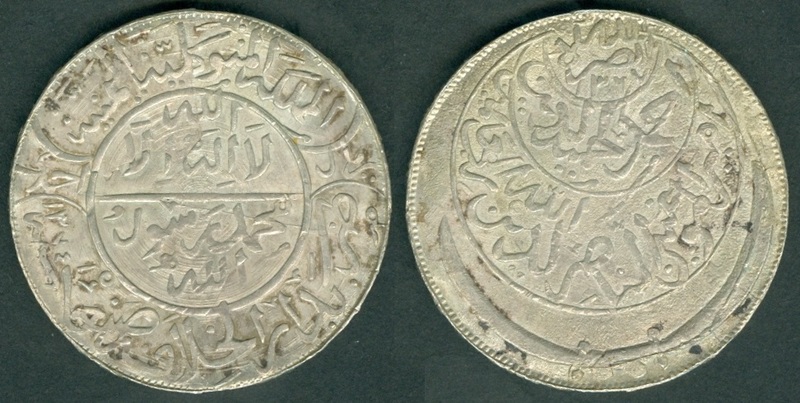 Note: Most AH1373 Riyals appear to be weakly struck from recut of AH1372 dies, therefore the date are easily confused. Above is an example of evidence showing that it is struck over Austrian Maria Theresa Thaler. 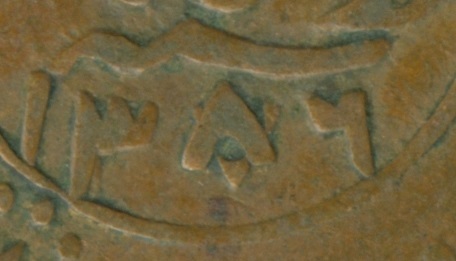 Picture of the decorated with lettering edge is also shown above right as a reference to coin collectors. Year: AH 1374 (1954). Weight: 27.54 g. Mintage: N.A. Part of ex-jewelry. Clip removed. 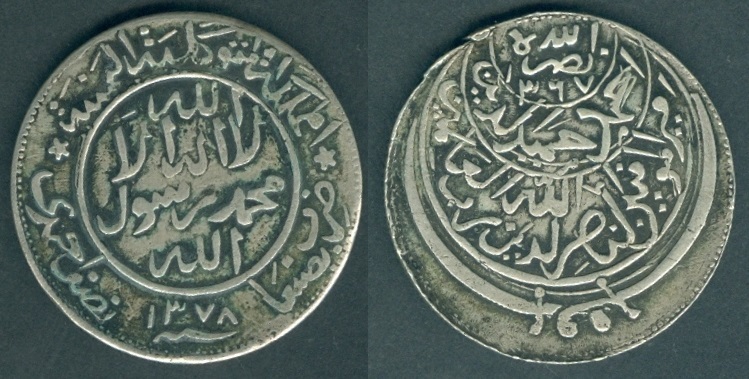 Edge lettering on this coin in my collection is readable when the Accession Date "1367" side it at the top. Year: AH 1375 (1955). Weight: 28.37 g. Mintage: N.A. Part of ex-jewelry. Clip removed from top and bottom ends. 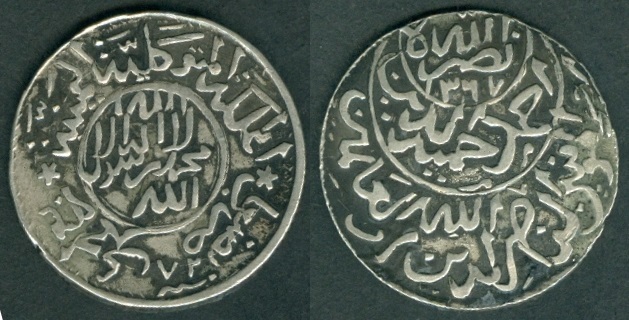 Edge lettering on this coin in my collection is readable when the Accession Date "1367" side it at the top.